S – Art for Art's Sake! “Maritime scene with Martello Tower and Tall Ships” oil on panel (9″ x 13″). 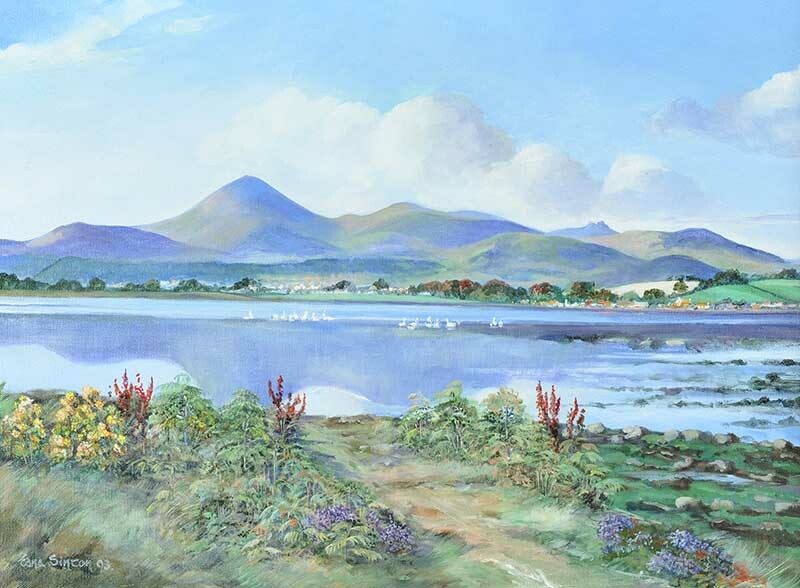 A View over Dublin Bay Looking Towards Howth, Ireland’s Eye and Lamb Bay, with Frascati in the foreground, together with figures and animals. 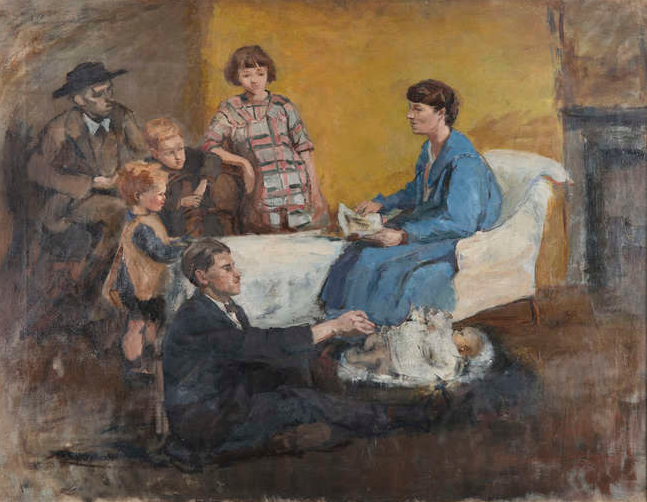 Oil on panel (19″ x 31″), sold at Adam’s (Townley Hall Sale) – 11/10/2016 for €11,700.00. 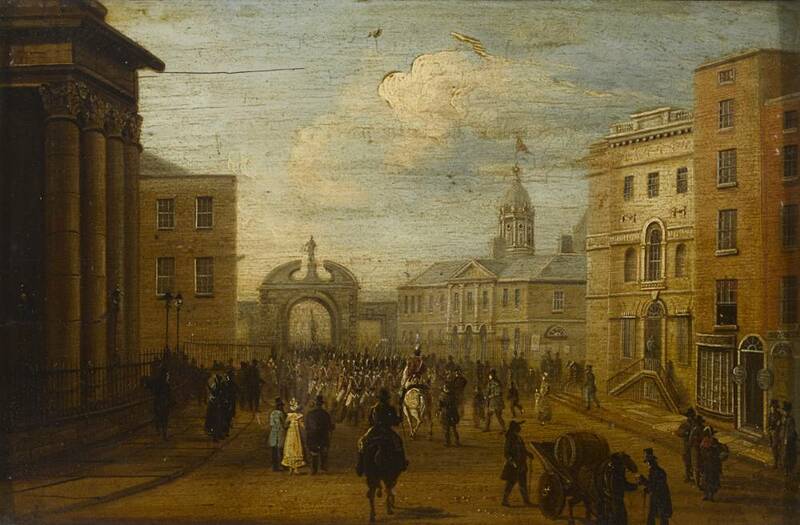 A View of Dublin Castle from Dame Street. Oil on panel (8″ x 12.5″), unsold at Whyte’s – 1/10/2018. “Bullock Castle, Dalkey” oil on panel (8″ x 10.5″), unsold at Adam’s – 27/3/2019. 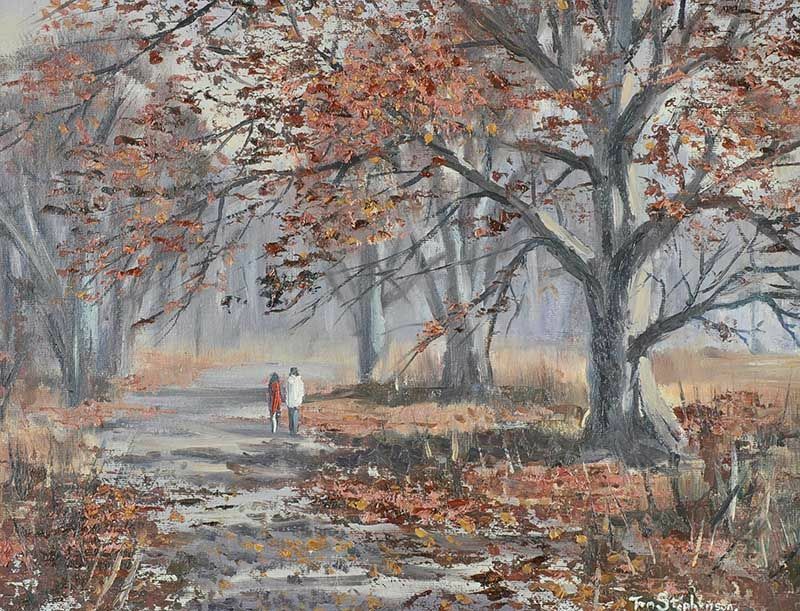 “A Walk in Glencree” oil on pencil on canvas (13″ x 9.5″), sold at de Vere’s – 12/4/2005 for €1,500. 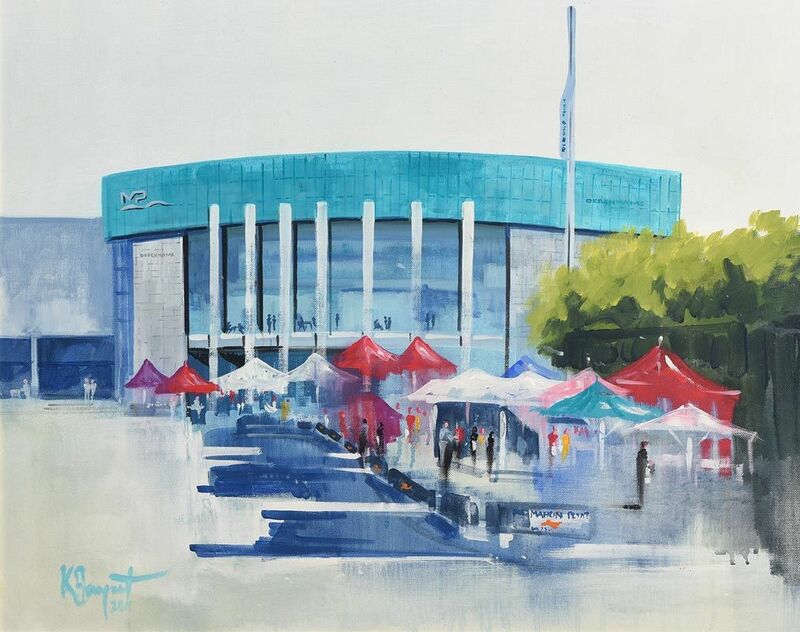 “Mahon Point Market” dated 2011, oil on canvas (24″ x 30″). Sold at Morgan O’Driscoll’s – 2/8/2016 for €260.00. 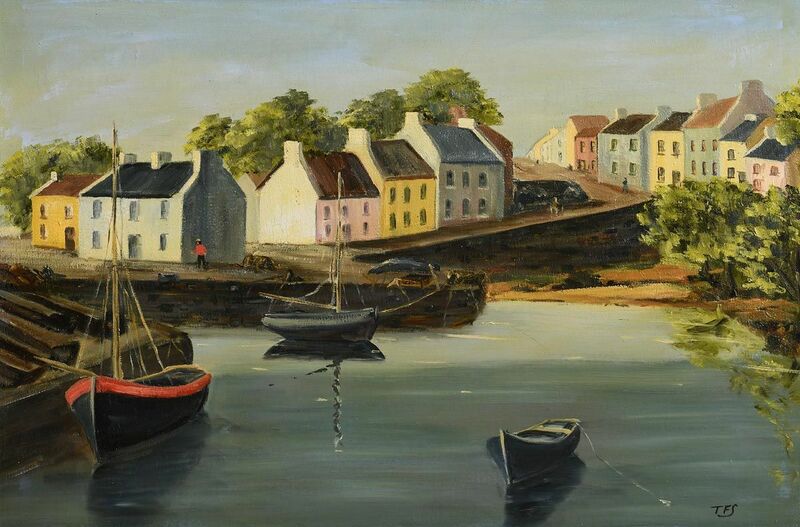 “Roundstone Harbour” oil on canvas (16″ x 24″), sold at Morgan O’Driscoll’s – 14/8/2018 for €260.00. 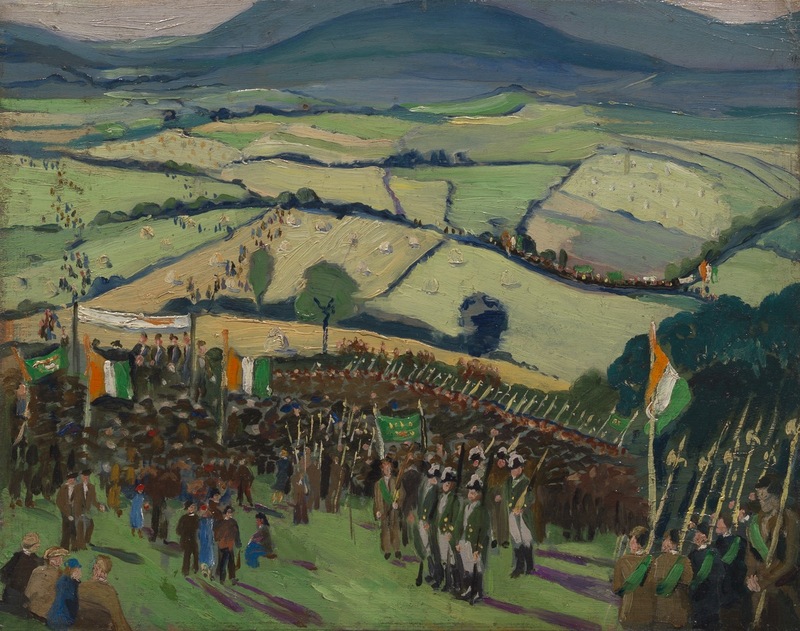 “1798 Commemorations at Donard, Co.Wicklow” (1938) oil on wood panel. Sold by Aspire Auctions, Cleveland, USA for $1,200. 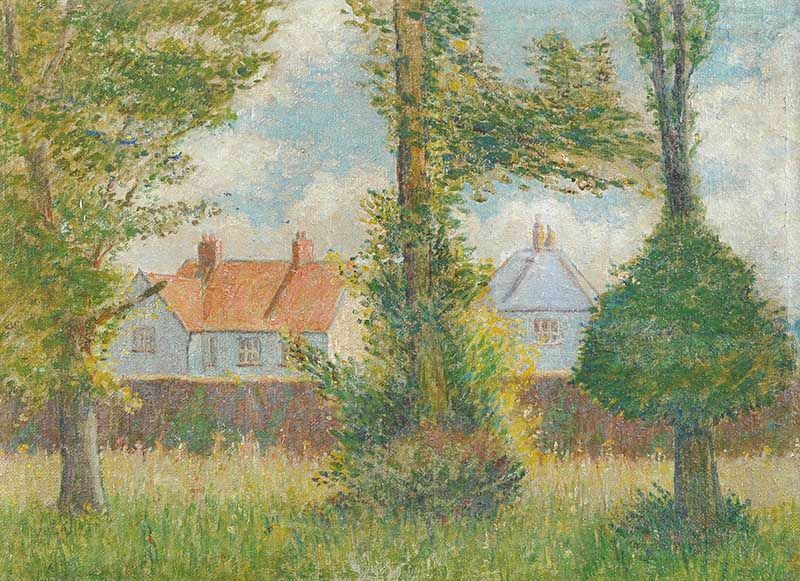 “Woodland Village Scene” oil on board (15.5″ x 19.5″), sold at Criterion Auctioneers, Islington, London – 30/4/2018 for £320.00. “Ruins in Landscape” oil on board (14.5″ x 21″), sold at Adams – 24/2/2019 for €570.00. 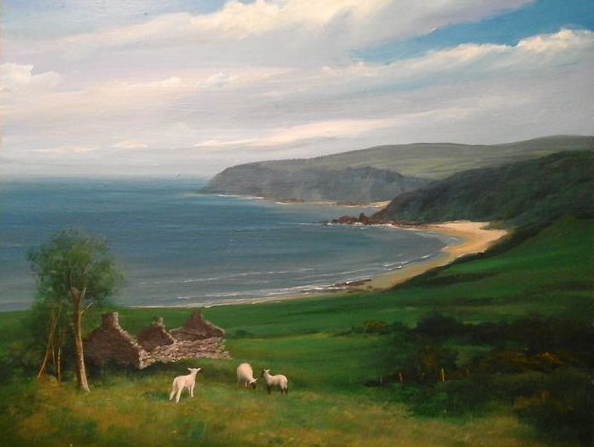 Donegal based artist who specialises in painting Irish rural and coastal scenery in acrylics and oils. 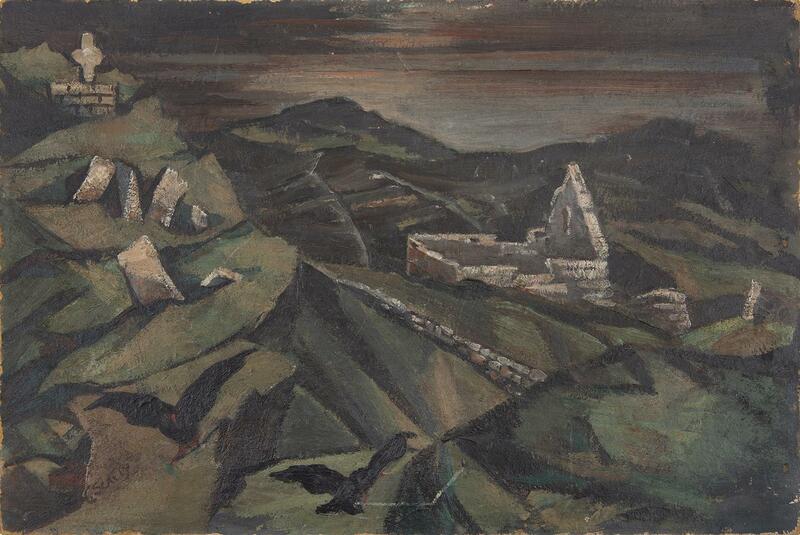 “Three Sheep Grazing on a Hillside near a Ruined Homestead overlooking Kinnegoe Bay“. Acrylic on MDF board. 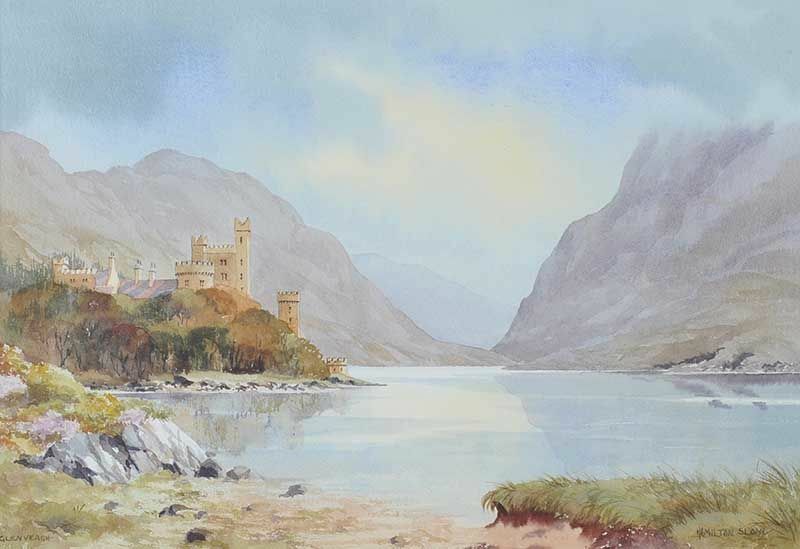 The artist was born in Dublin, attending both Belvedere and Clongowes Wood colleges. Later he worked in London where he also studied at the Slade School of Fine Art. Apparently, he remained an amateur artist throughout his life and never exhibited his work. Below – a small selection of his work that has been sold on eBay over the last couple of years. 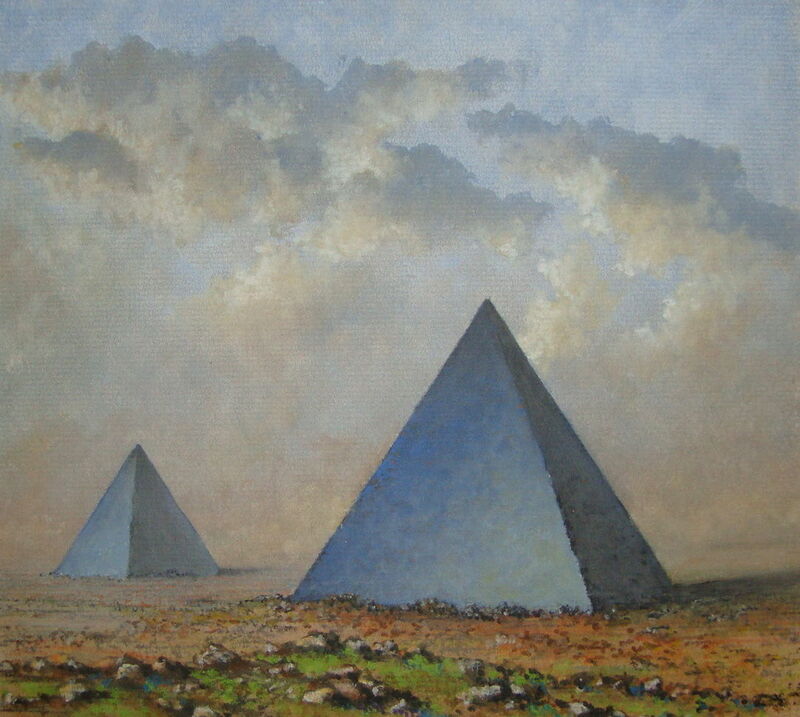 Left to right: “Pyramids“; “Dunguaire Castle” and “The Old Man and the Sea“. Left to right: “Sleeping Partner” (11.5″ x 14.5″) oil on panel sold at Whyte’s 30/11/2015 for €900.00; and an untitled equestrian portrait (21″ x 29″) oil on canvas. 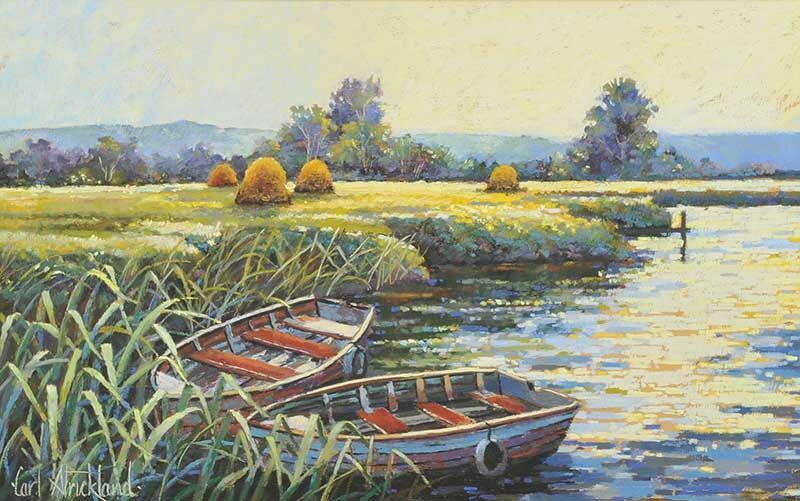 “Coming to the Scratch” oil on panel (3.5″ x 12.5″), sold at Woolley & Wallis, Wiltshire – 6/3/2019 for £2,200. 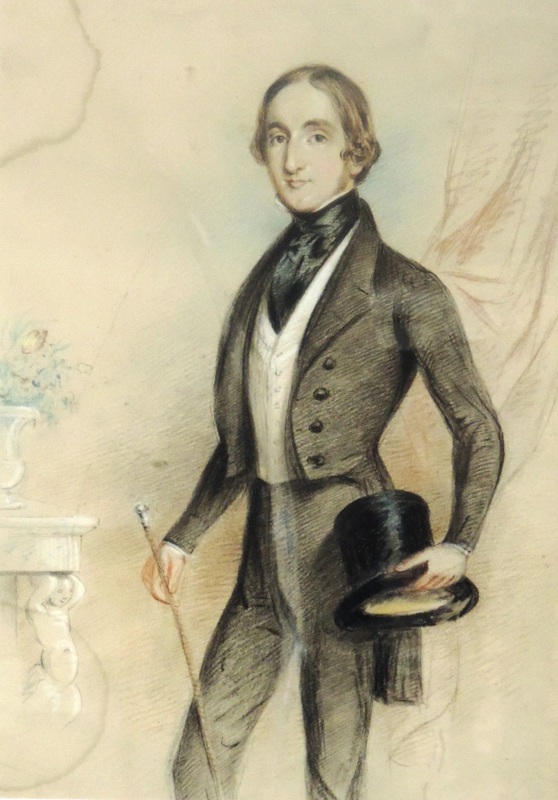 “Portrait of William Henry Barry, J.P. of Ballinw..? Rockmills, Co. Cork, age 24” coloured chalks (14″ x 10″), sold at Fonsie Mealy’s – 8/3/2017 for €120.00. 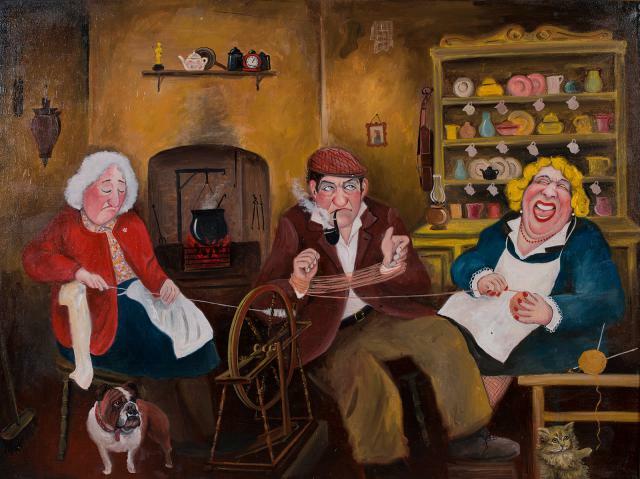 “Marriage of Convenience” dated 2011, oil on canvas (29.5″ x 39.5″), sold at Dolan’s (Connemara Auction – Aug.2016) for €1,275. “Market Square” dated 2012, oil on canvas (29.5″ x 39″), sold at Joe Mullen Associates – 13/2/2017 for €540.00. “Right of Way, Mullinavat, County Kilkenny” dated 2016, oil on canvas (24″ x 30″), sold at Whyte’s – 17/7/2017 for €680.00. 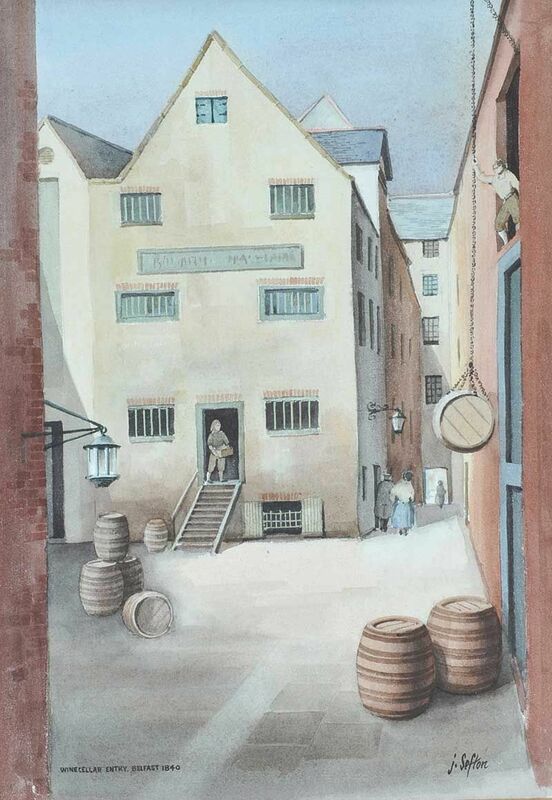 “The Rick-Yard” (1908) watercolour (22″ x 26″) sold at Whyte’s – 11/3/2015 for €480.00. 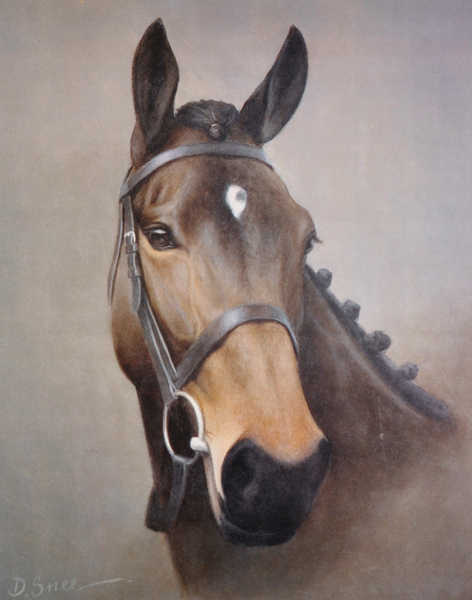 Any information about this artist – please! Left to right: “High Street, Belfast” watercolour drawing (10″ x 14″), sold at Ross’s – 10/8/2016 for £80.00; and “Wine Cellar Entry, Belfast” watercolour drawing (14″ x 10″), sold at Ross’s – 3/5/2017 for £10.00. Left to right: “Waterfall II, Downhill Forest” watercolour drawing (10″ x 7″), sold at Ross’s – 7/9/2016 for £50.00; and “Killowen Parish Church, Coleraine” watercolour drawing (7″ x 9″), sold Ross’s – 20/6/2018 for £60.00. 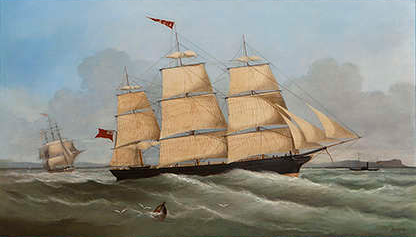 “A Ship in Belfast Lough” oil on canvas (21″ x 36″) sold at Adams – 12/10/2014 for €3,000. 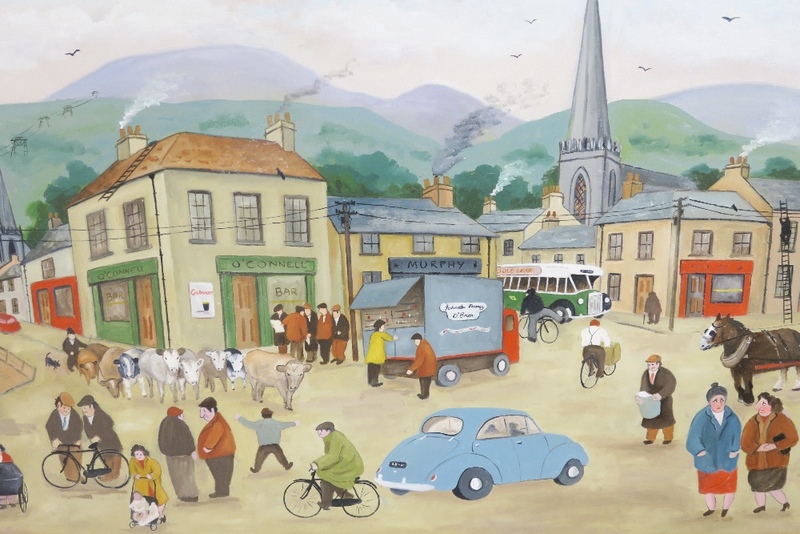 Dermot Seymour is a self-taught Belfast artist. He has been described as “a social realist, exploring the anxiety, bewilderment and absurdity of the situation in Northern Ireland and representing it with definite imagery but in an oblique and obscure way”. 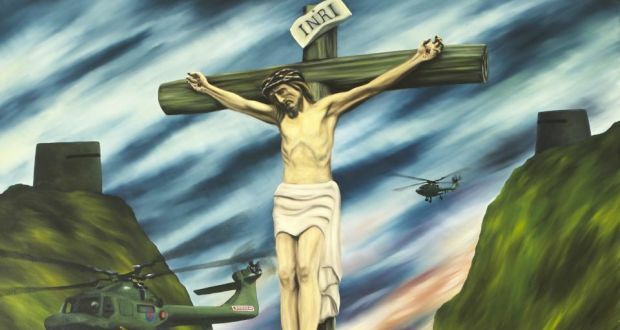 His social realist approach towards Northern Irish politics frequently involves a juxtaposition of images within the Irish landscape, particularly livestock, and religious and military symbols. 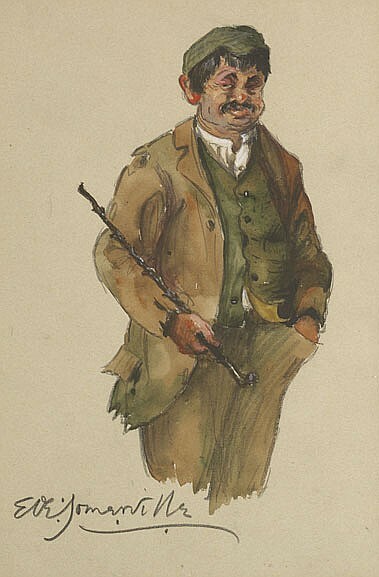 He lives in County Mayo and is a member of Aosdána. “The Queen’s own Scottish Borderers Observe the King of Jews Appearing behind Seán McGuigan’s Sheep on the Fourth Sunday after Epiphany” (1988). 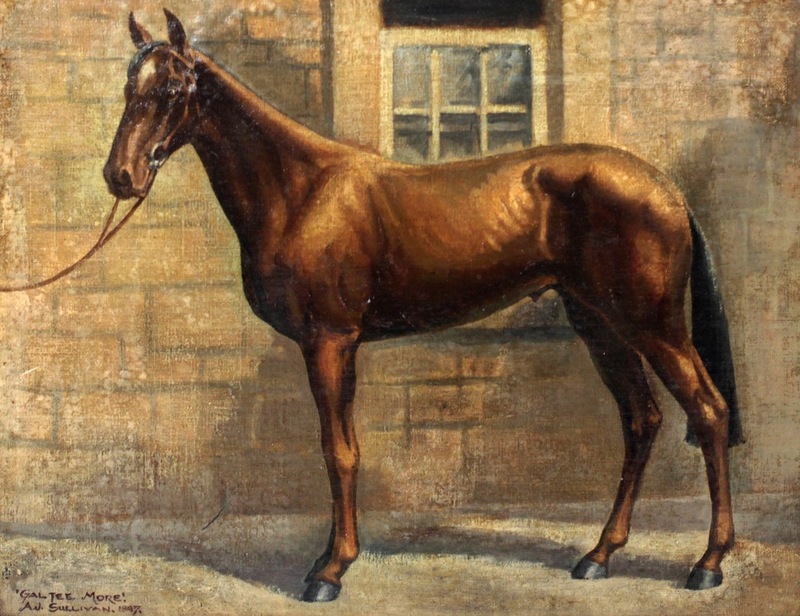 Sold at Whyte’s 23/2/2015 for €4,700.00. Lydia Shackleton was a botanical artist who studied at the Royal Dublin School of Art and Design. She was the first artist-in-residence at the Royal Botanic Gardens in Dublin, creating hundreds of botanic studies. 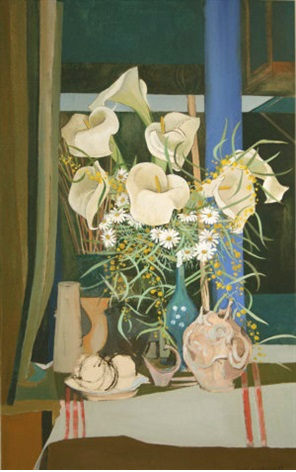 Left to right: “Duck lilies” (1963) oil on canvas and “Benwee Head, Broadhaven Bay, Co.Mayo” oil on board (28″ x 45″). A self-taught artist from County Tyrone. 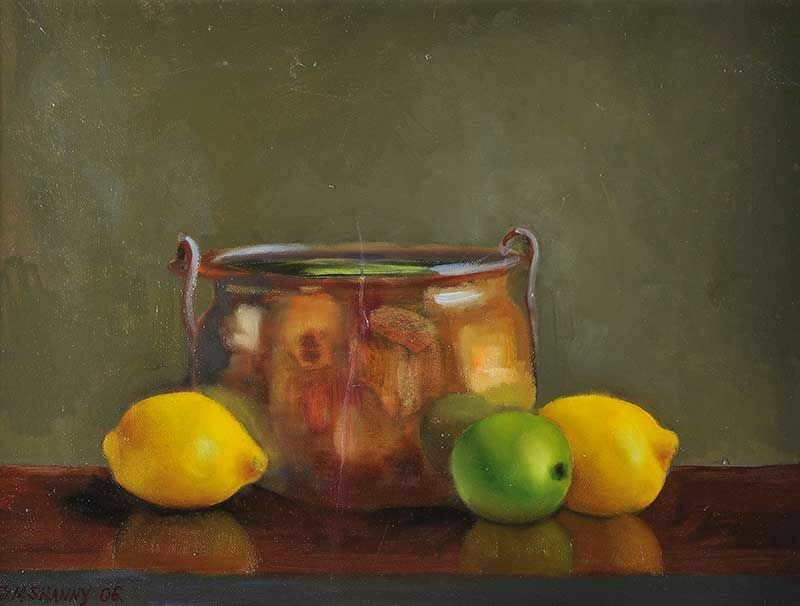 “Copper Pot & Lemons” oil on canvas (12″ x 16″), sold at Ross’s – 7/12/2016 for £60.00. 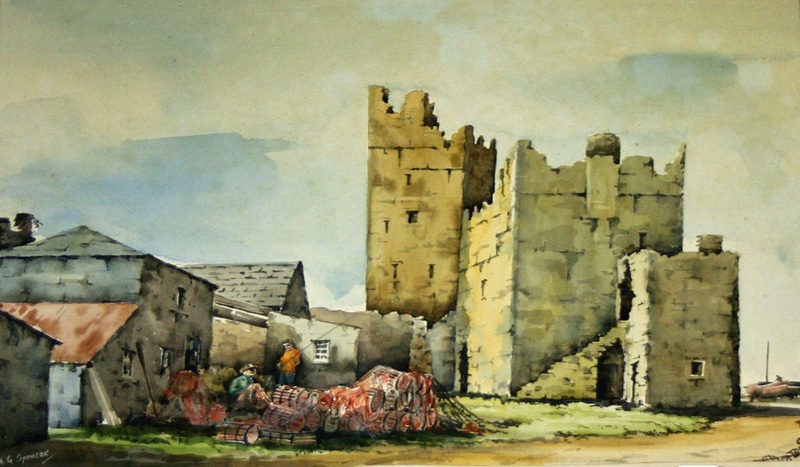 “View of the West Convent, on the Claddagh, Galway” dated 1844, 0il on canvas (33″ x 63″). 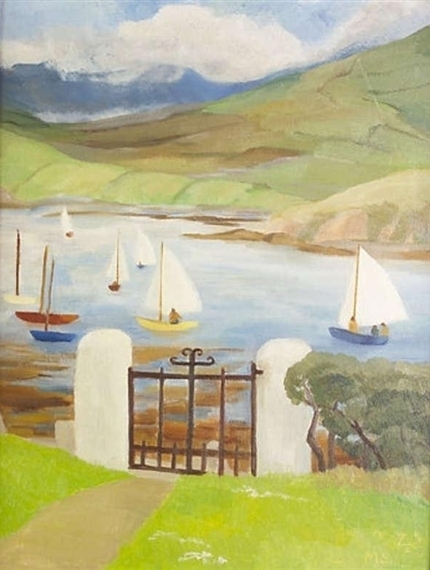 Sold as an unidentified painting at the Ballyfin House contents sale, on 5th October 2002 for a figure believed to be in the region of €3,000; after passing through several hands it was sold at Whyte’s – 25/4/2006 for €200,000.00. 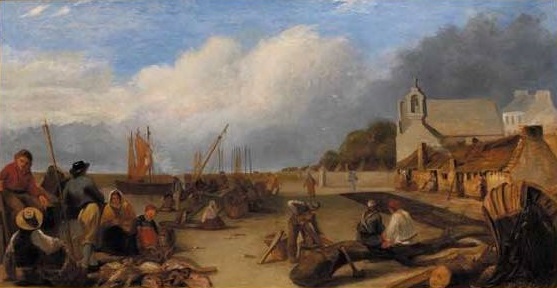 Works by George Sharpe are extremely rare and two further examples are held by the National Gallery. 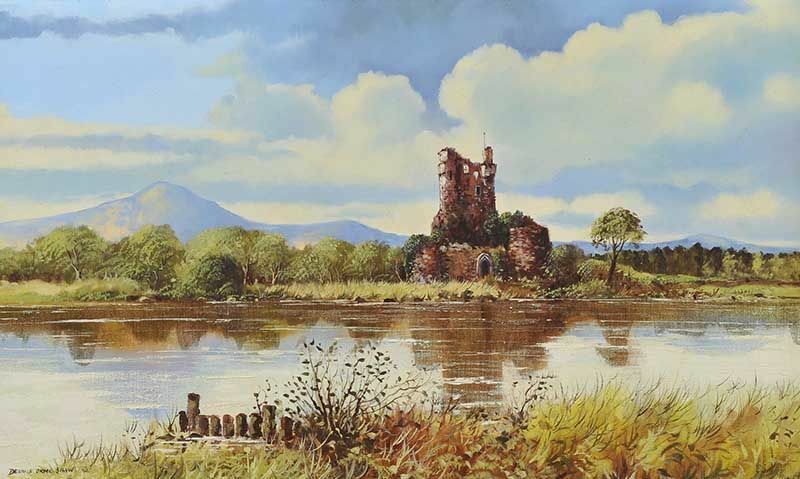 “Ross Castle, Killarney” oil on canvas (18″ x 30″), sold at Ross’s – 8/11/2017 for £90.00. “Farm Buildings” watercolour drawing (10″ x 6″), sold at Ross’s – 3/5/2017 for £80.00. 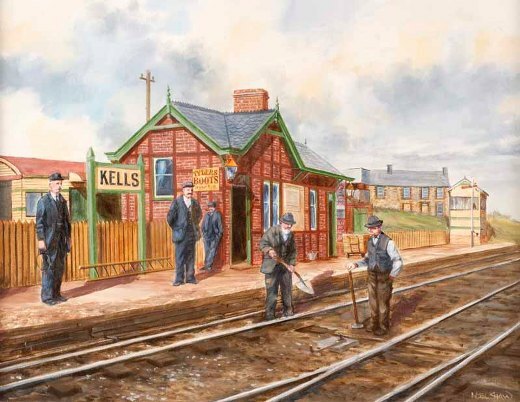 “Mending the tracks, Kells Station” oil on canvas. Sold at Ross’s 13/6/2012 – £240.00. 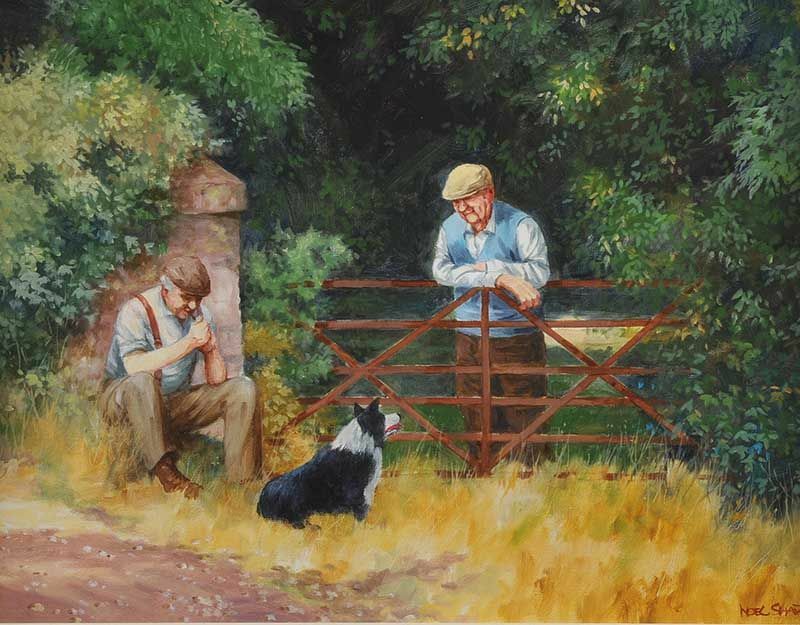 “A Chat at the Gate” oil on board (14″ x 18″), unsold at Ross’s – 1/3/2017. 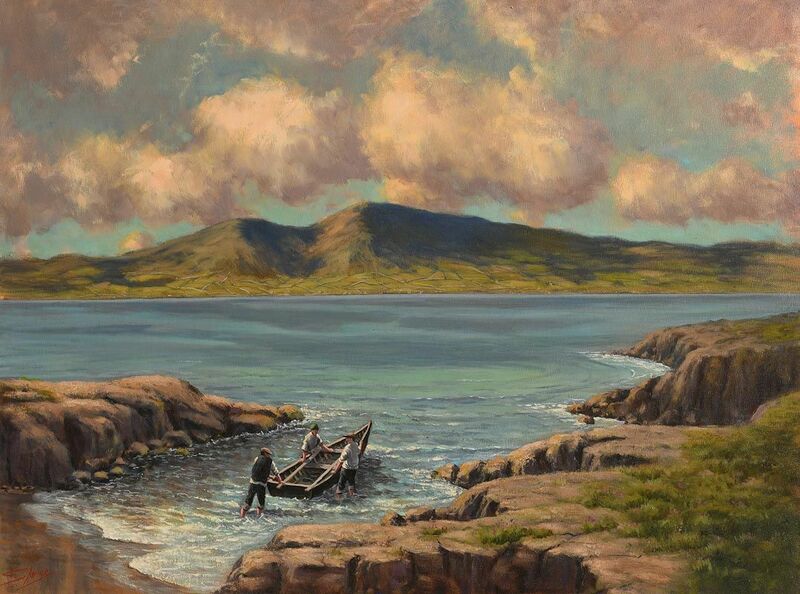 “Gathering the Kelp, Donegal” oil on canvas (14″ x 18″), sold at Morgan O’Driscoll’s – 14/8/2017 for €360.00. Born in Dublin and trained at Dun Laoghaire School of Art and Design in the late nineteen eighties. 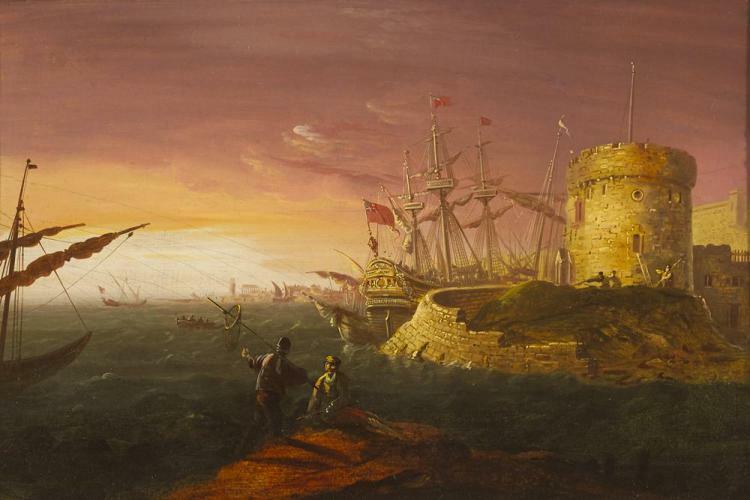 Left: “October Evening, Malahide” oil on panel and Right: “Arrival of the Tuath” oil on panel. 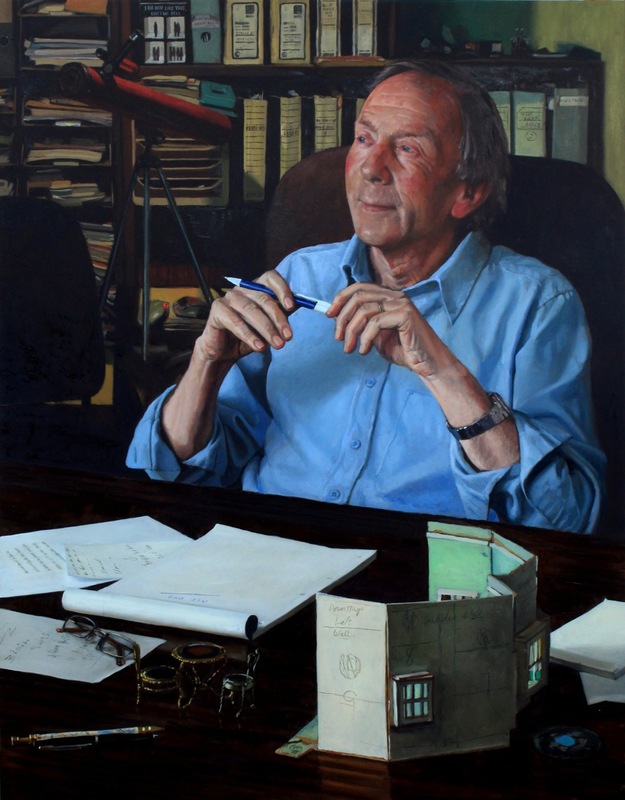 Dublin-born portrait painter and president of the Royal Academy. Portrait of poet Thomas Moore now in the National Gallery of Ireland. 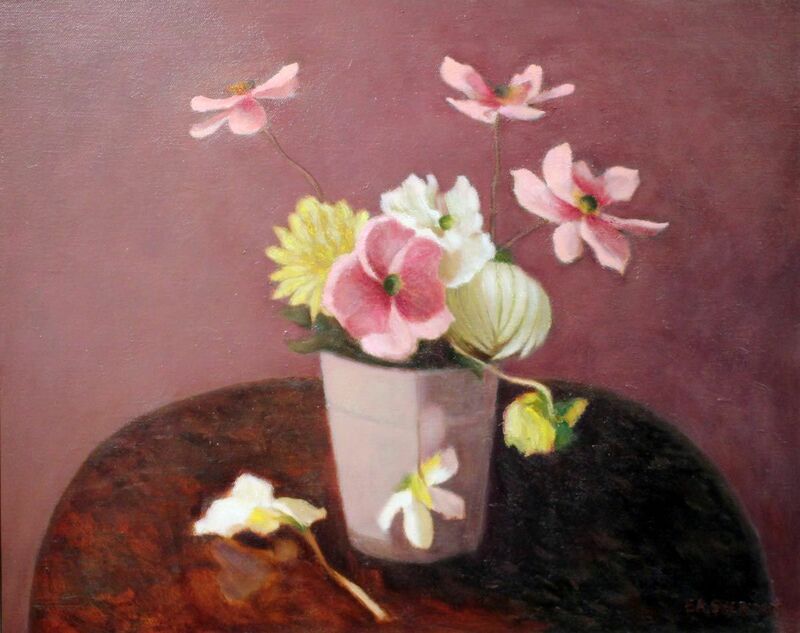 County Antrim based artist specialising in oil painting, still life, landscape, figurative paintings. “Japanese Anemones, Dahlias and Begonias” oil on canvas (16″ x 20″), unsold at Gormley’s – 5/9/2017. 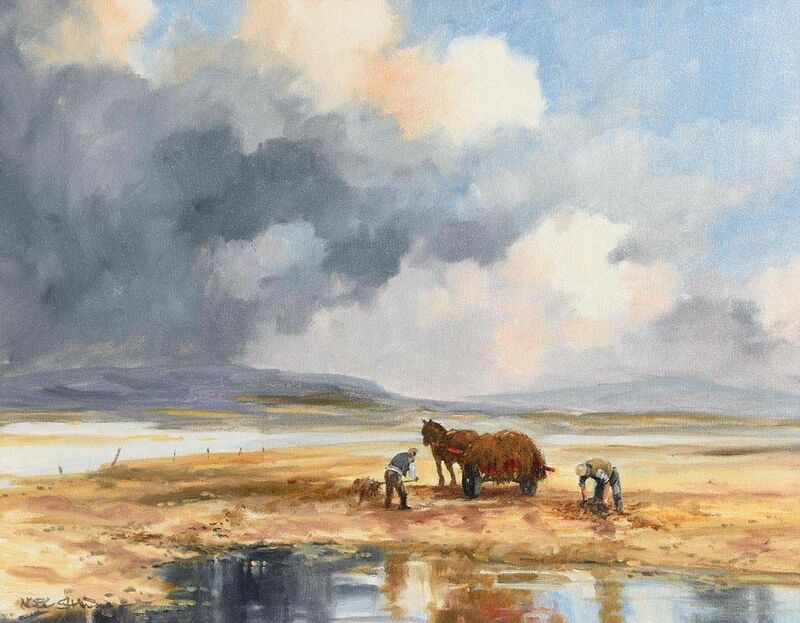 Self-taught Dublin artist specialising in original oil paintings and landscapes of Ireland. 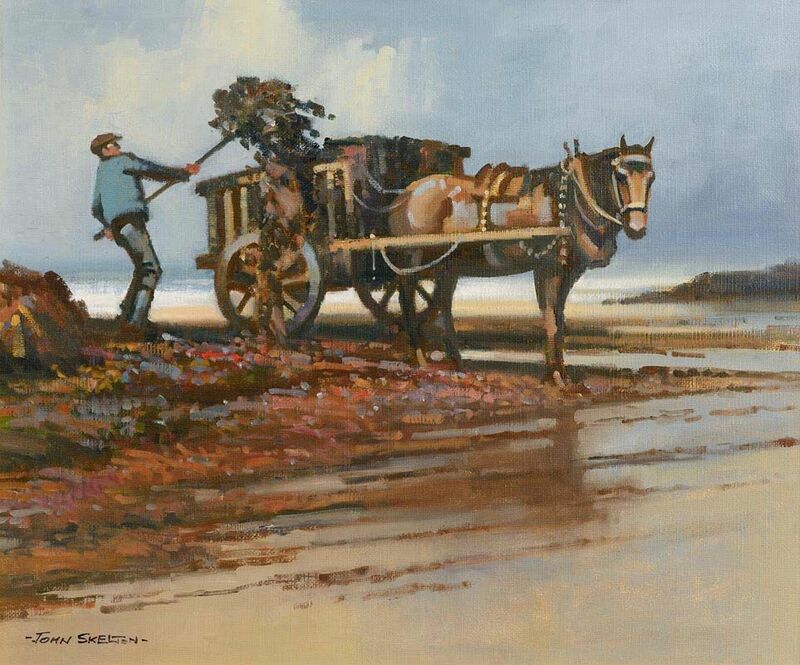 “Autumn” oil on canvas – available from Kenny’s, Lahinch Art Gallery. 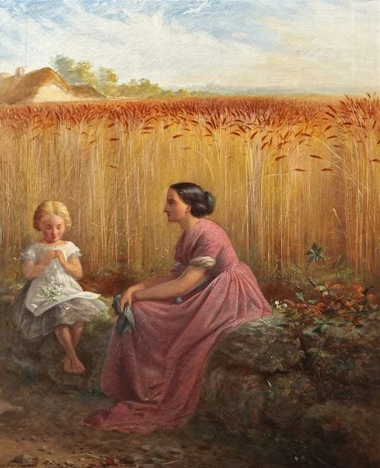 “Making Daisy Chains at the corner of a Cornfield” dated 1857, oil on canvas (25″ x 6.5″). “Pomegranates” 1995, acrylic on board (11″ x 11″), sold at Adam’s – 27/9/2017 for €2,000. 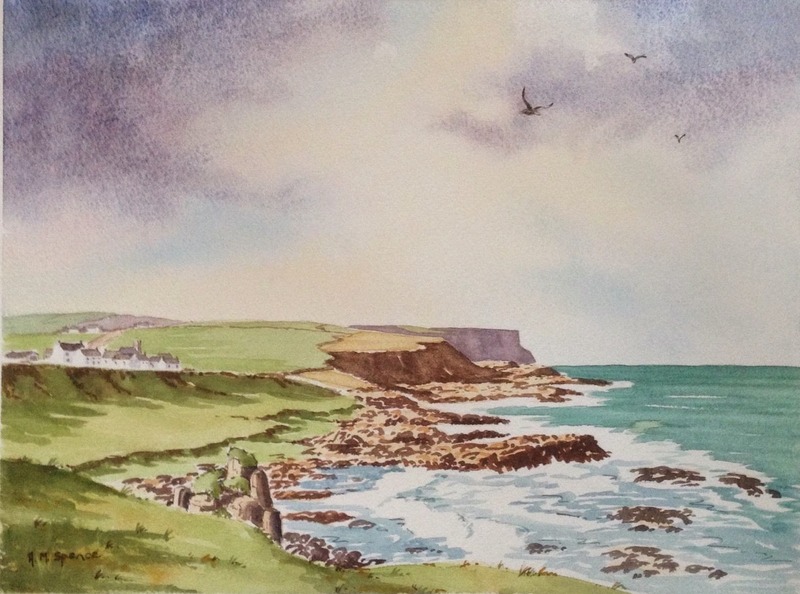 Alan is a watercolour artist who has been painting local landscapes since moving to Clare in 1990. 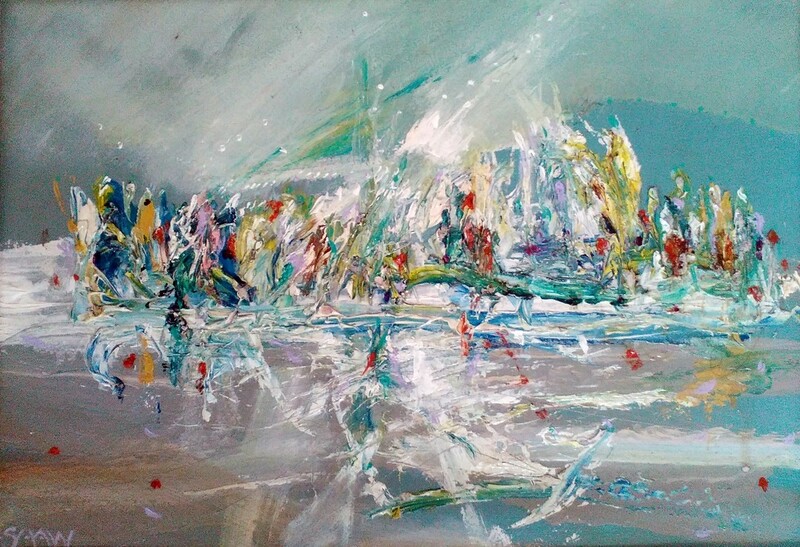 “Shipping on the Liffey” oil on canvas (24″ x 20″), sold at de Vere’s – 21/10/2012 for €600.00. Scottish born but living and working in Ireland for more than 30 years. 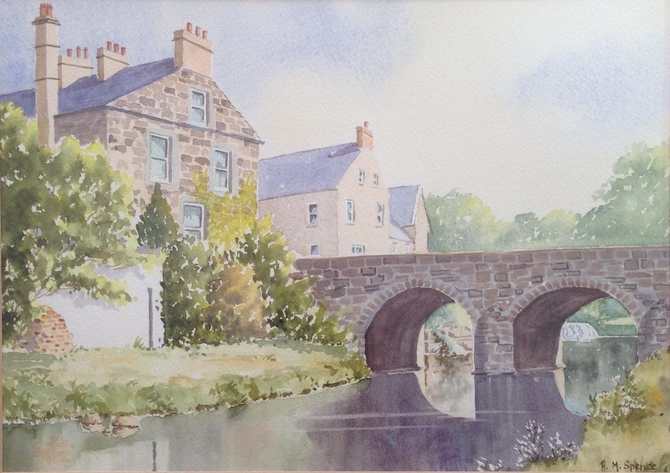 Kevin Simms is a self-taught artist from Kilcock, Co. Kildare. 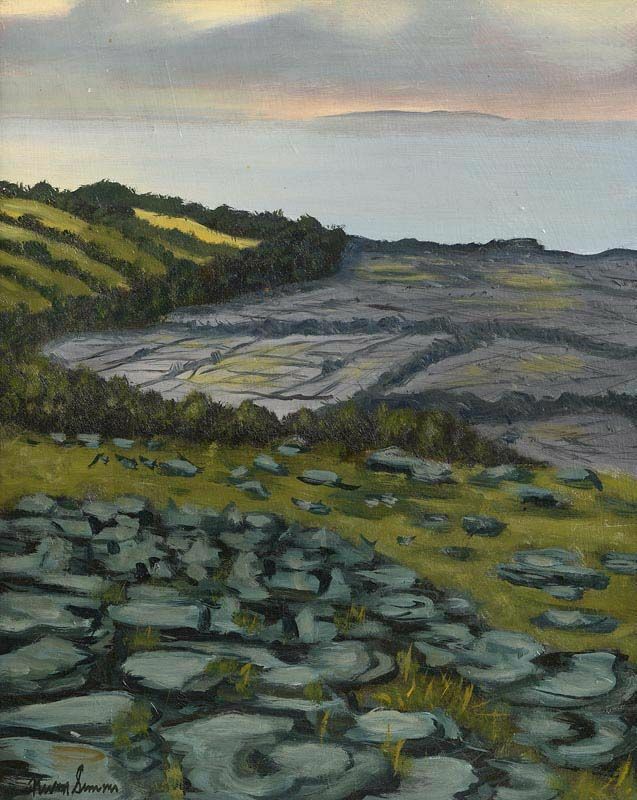 Left to right: “The Burren” oil on board (20″ x 16″), sold at Morgan O’Driscoll’s – 22/5/2017 for €550.00; and “Huband Bridge” dated 1974, oil on board (22.5″ x 31″). 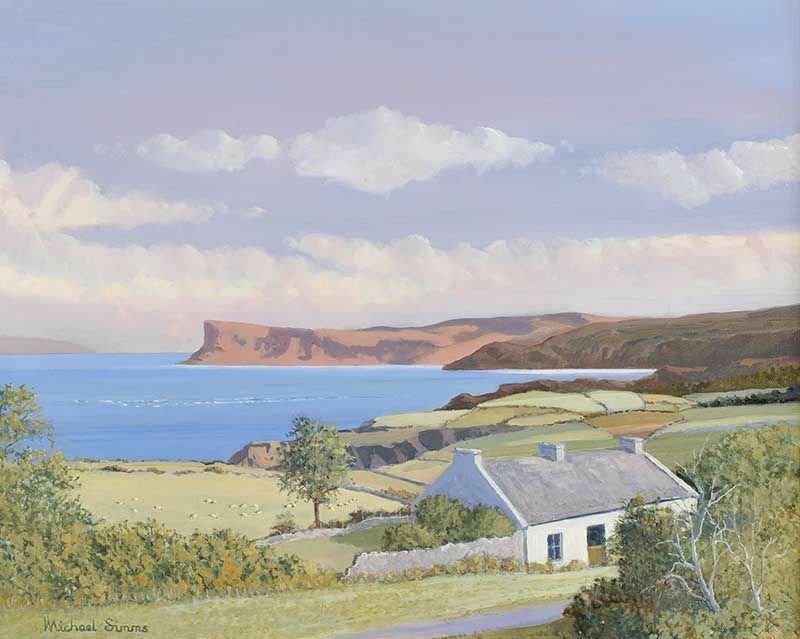 “Fairhead” oil on canvas (16″ x 20″), sold at Ross’s – 5/10/2016 for £100.00. “Swans on a lake” oil on canvas (16″ x 22″), sold at Ross’s – 29/3/2017 for £40.00. 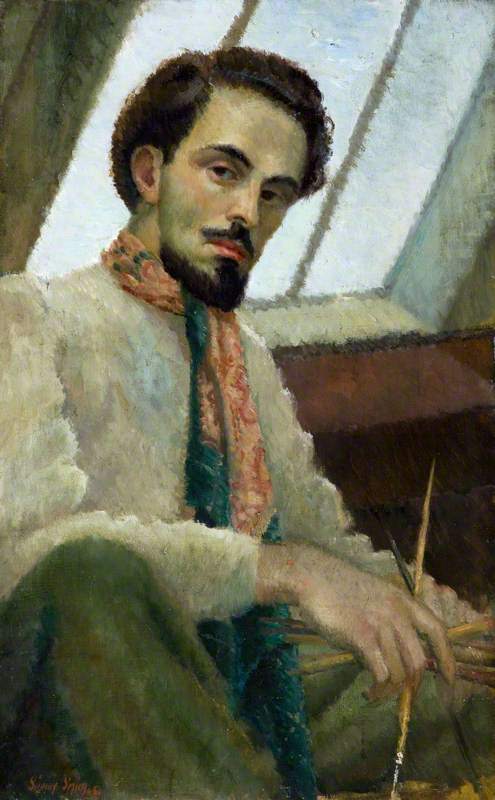 Dublin born portraitist, miniaturist and pastellist. 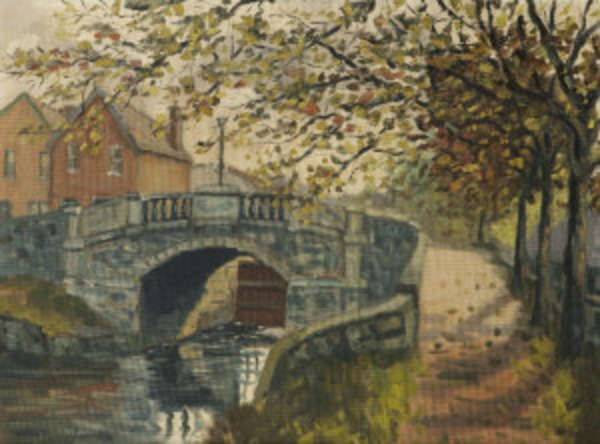 “Autumn on the Dodder” oil on canvas (20″ x 24″) sold at Morgan O’Driscoll’s – 2/8/2016 for €1,600.00. 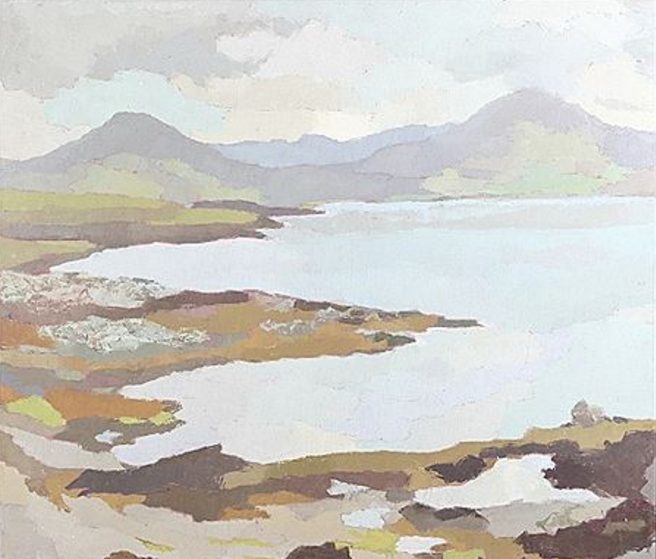 Left to right: “Seaweed Harvest, Mannin Bay, Connemara” oil on canvas (20″ x 24″), sold at Morgan O’Driscoll’s (RDS) – 10/4/2017 for €3,400; and “Cattle in Winter, Phoenix Park, Dublin” oil on board (16″ x 20″), sold at Whyte’s – 28/5/2018 for €1,150. 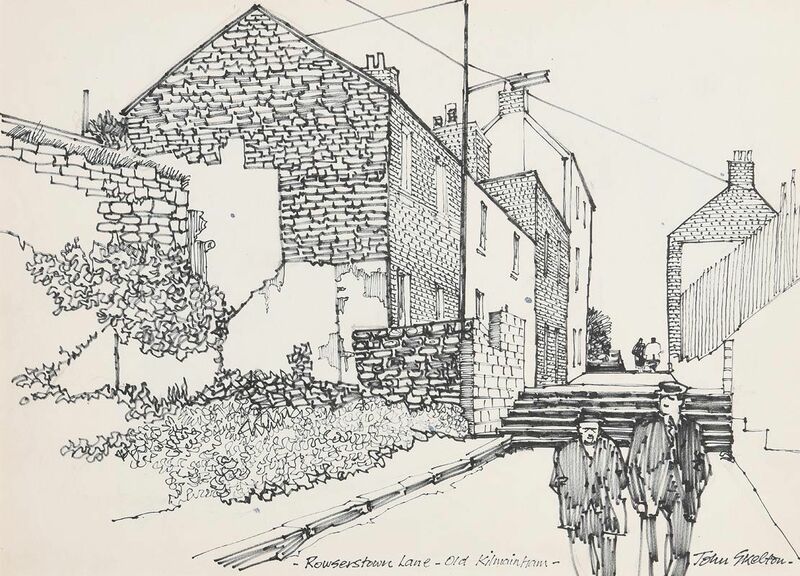 “Rowserstown Lane, Old Kilmainham” ink drawing (11.5″ x 15.5″), sold at Morgan O’Driscoll’s – 10/12/2018 for €180.00. 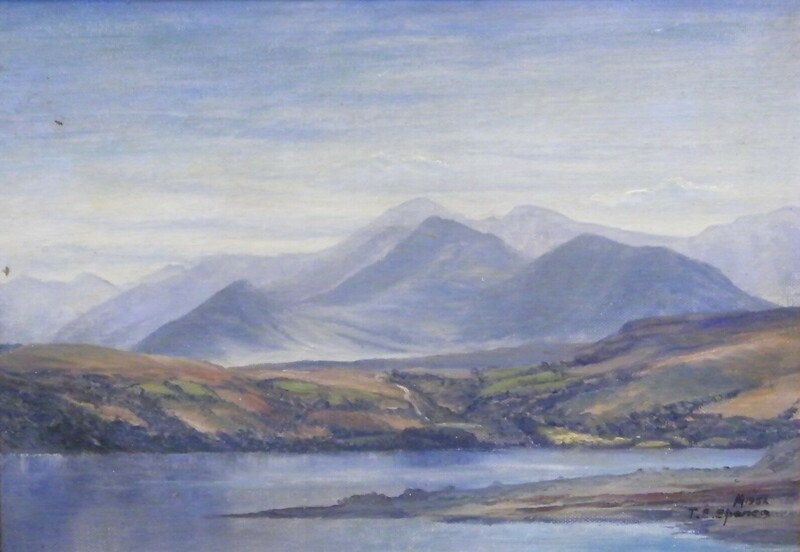 ‘Home from the Storm, Lough Conn, Co.Mayo’ oil on board (10″ x 24″), sold at Morgan O’Driscoll’s – 22/1/2018 for €850.00. 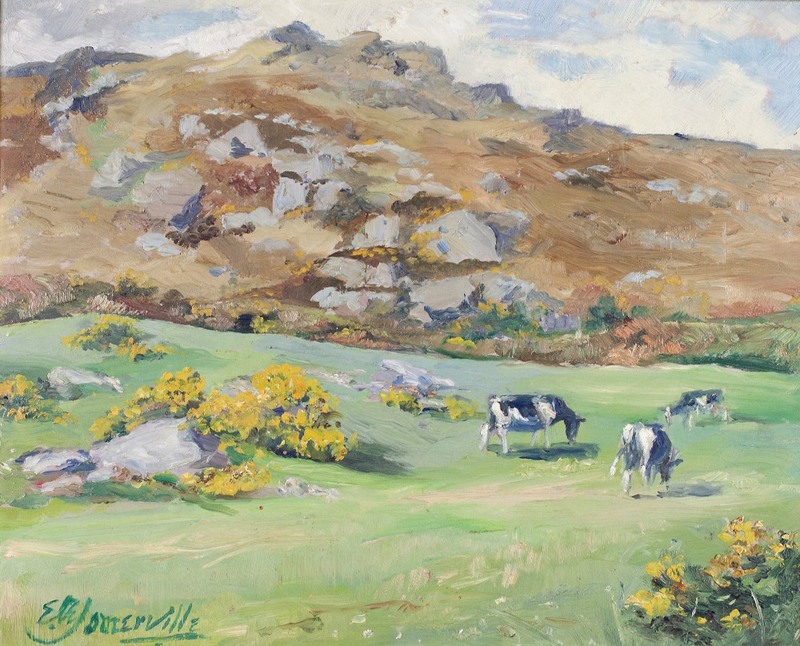 “Spring Light, Charlesland, Greystones, Co.Wicklow” oil on board (9″ x 23″), sold at Morgan O’Driscoll’s – 3/10/2016 for €320.00. “A Moment, Union Hall, Cork” oil on canvas board (15.5″ x 19.5″), sold at Morgan O’Driscoll’s – 24/9/2018 for €320.00. 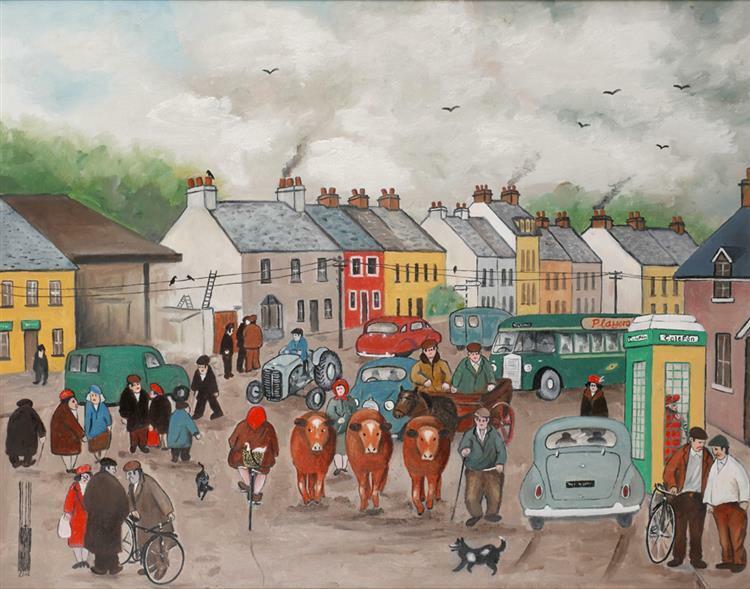 “Another Lovely Day” gouache (21″ x 29″), sold at Morgan O’Driscoll’s – 28/1/2019 for €420.00. 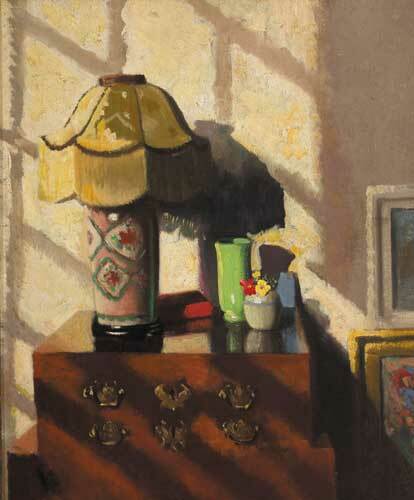 “Corner of the Studio” 1930/31, oil on canvas (24″ x 20″), sold at Whyte’s – 25/4/2006 for €34,000. 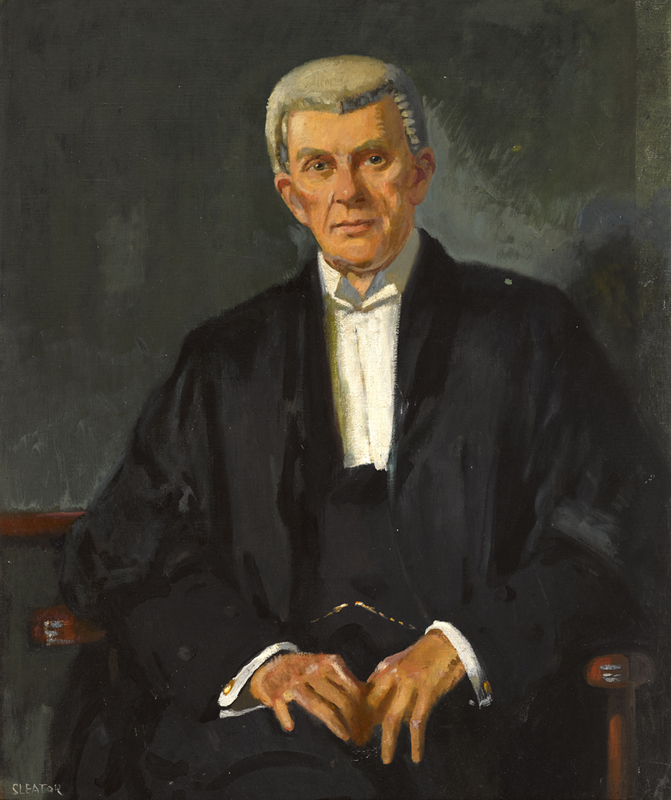 “Portrait of Judge James Sealy at St.Margaret’s, Donnybrook, Dublin c.1930” oil on canvas (35.5″ x 29.5″), sold at Whyte’s – 29/5/2017 for €1,250. 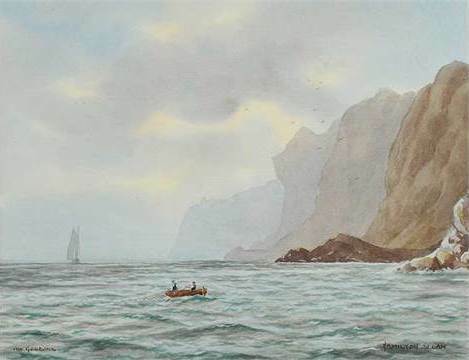 “The Gobbins” watercolour drawing. 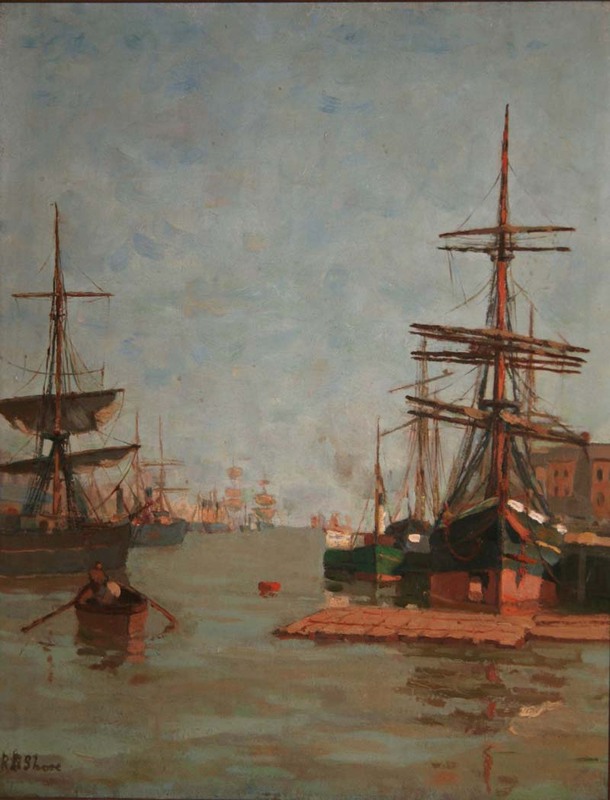 Sold Ross’s 9/3/2016 – £220.00. 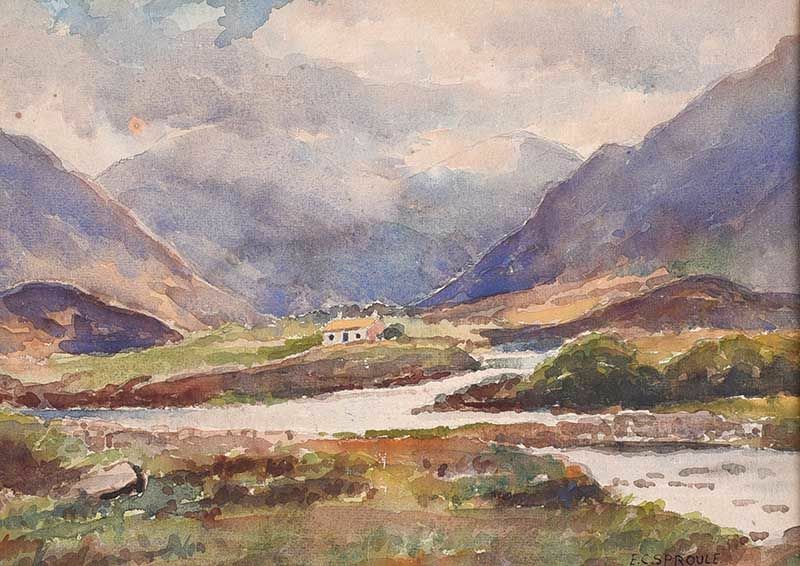 “Glenveagh, Donegal” watercolour drawing (14″ x 20″), sold at Ross’s – 9/11/2016 for £1,000.00. 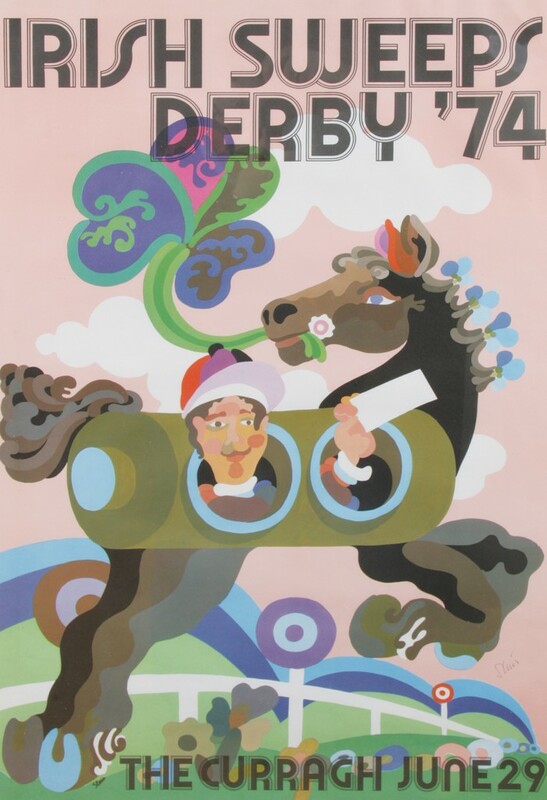 A Dutch born artist who moved to Ireland in 1956 and had a distinguished career as a graphic designer. 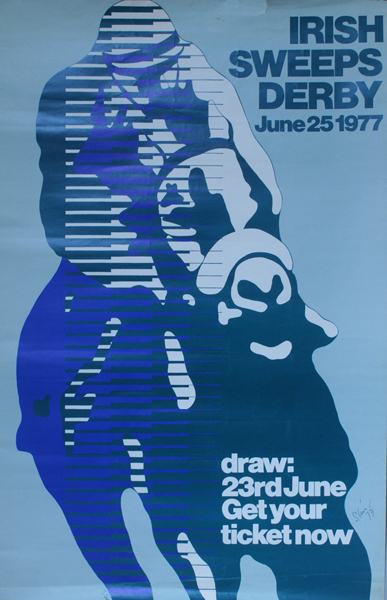 A selection of the artist’s poster work – more to come. 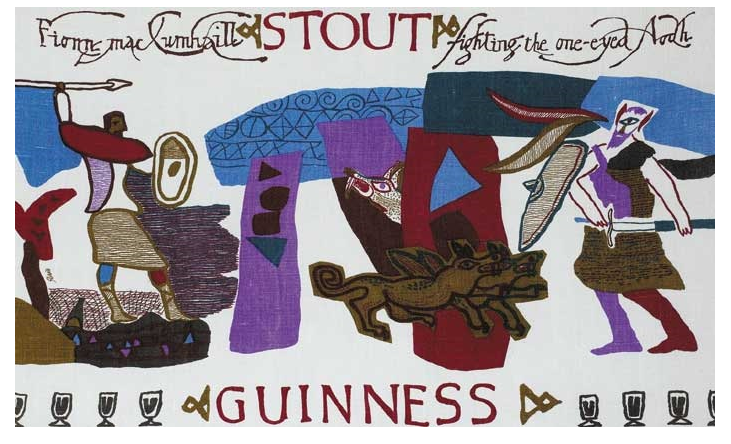 Prototype Guinness advertising tea-towel, printed in the early 1960s featuring Fionn Mac Cumhaill fighting the one eyed Aodh. Sold at Whyte’s – 15/12/2007 for €450.00. 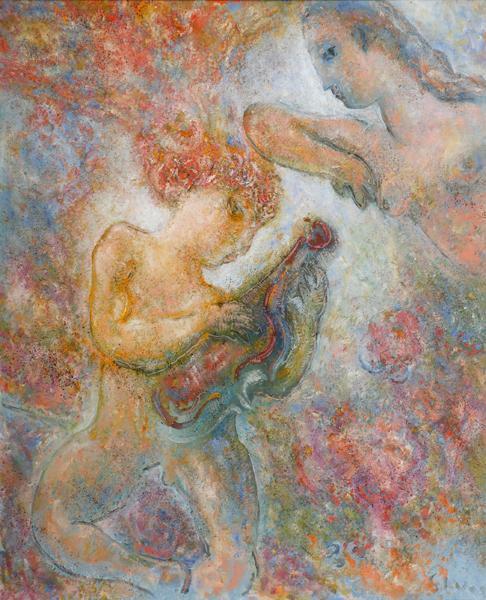 “Musical Interlude” oil on board (22″ x 18″), sold at Whyte’s Online Sale – 24/10/2016 for €1,000.00. Blaise Smith was born in 1967. He attended the National College of Art & Design (NCAD). 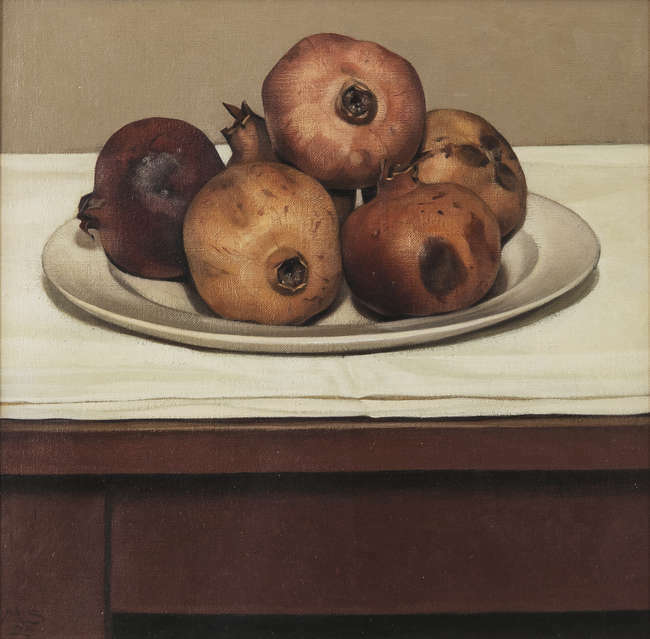 As a figurative painter he has exhibited widely and his work is held in many Public and Private Collections. In 1999 he completed “Roadworks”, a set of twenty four paintings depicting the men and machines of Cork County Council. 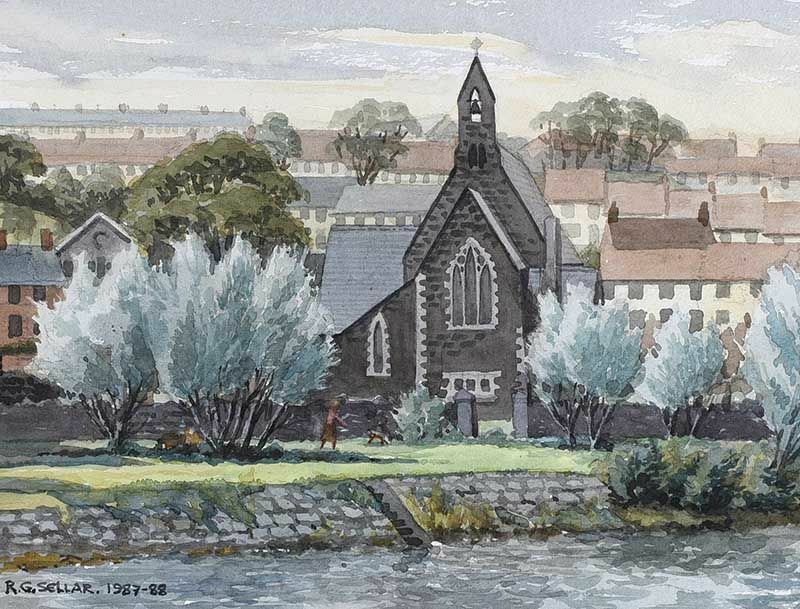 The following year he painted ten paintings for Kilkenny County Council entitled “The Millenium Landscape”. He has continued to win many awards and state commissions, most recently winning the Eigse Open Award in 2015. Smith is currently working on “A Painting for Waterford” – a commission arising from another competitive process. 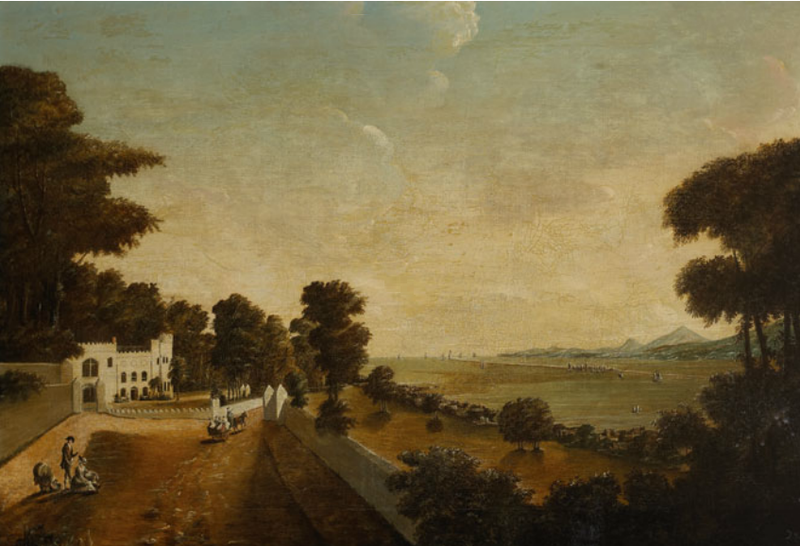 This painting is a dramatic 5 metre panorama of the city of Waterford commissioned by the OPW, to act as a companion piece to the 1735 Willem Van der Hagen Waterford cityscape. Both will be unveiled in Autumn 2016. 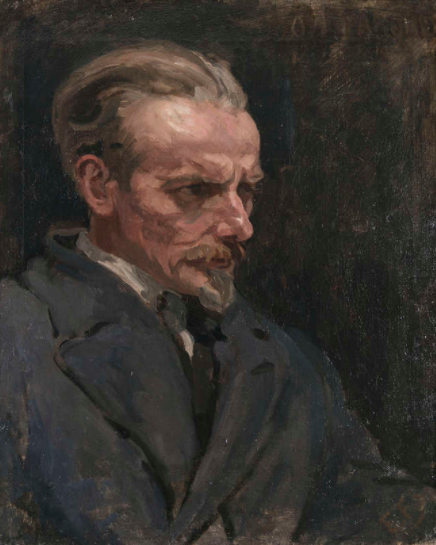 A substantial part of Smith’s practise involves Portraiture and he has recently completed a portrait of Bernard Farrell the playwright, commissioned by the Abbey Theatre. He was appointed Assistant Principal of the RHA Drawing School in 2013 and served on the Council of the Royal Hibernian Academy from 2013-15. He was appointed by the Minister for Education to the Board of the National College of Art and Design in 2015. 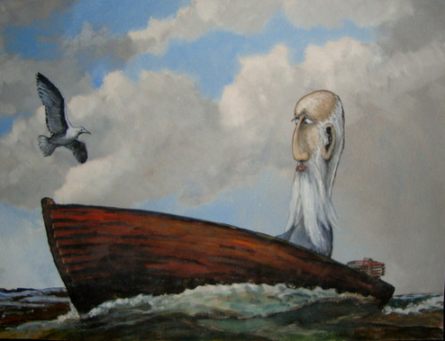 “O’Keefe’s Sheds” 91 x 244 cm, oil on gesso panel, © 2002 – 2004. 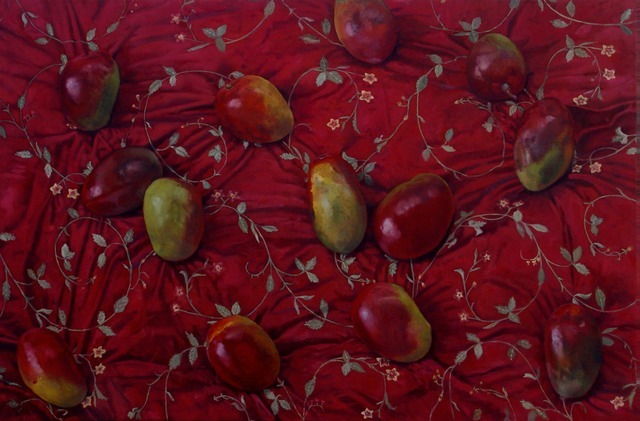 “Mangoes” (40″ x 60″) oil on Canvas © 2006. 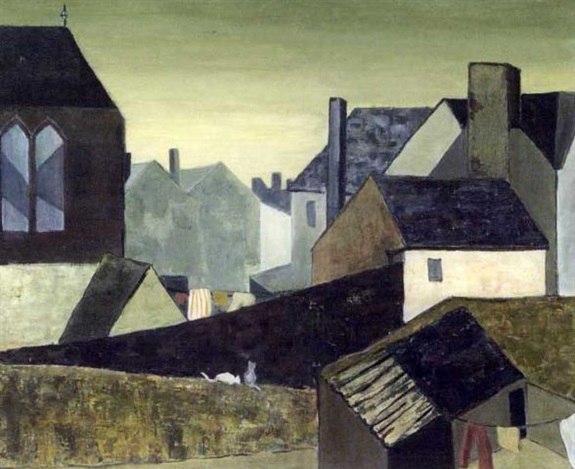 “Backyards, Irishtown, Dublin” dated 1973, Oil on canvas (20″ x 24″) sold at Adams – 24/9/2003 for €500.00. Sidney Smith was born in Belfast and educated at the Royal Belfast Academical Institution. He attended evening classes at the Belfast College of Art, and also had private tuition in drawing. 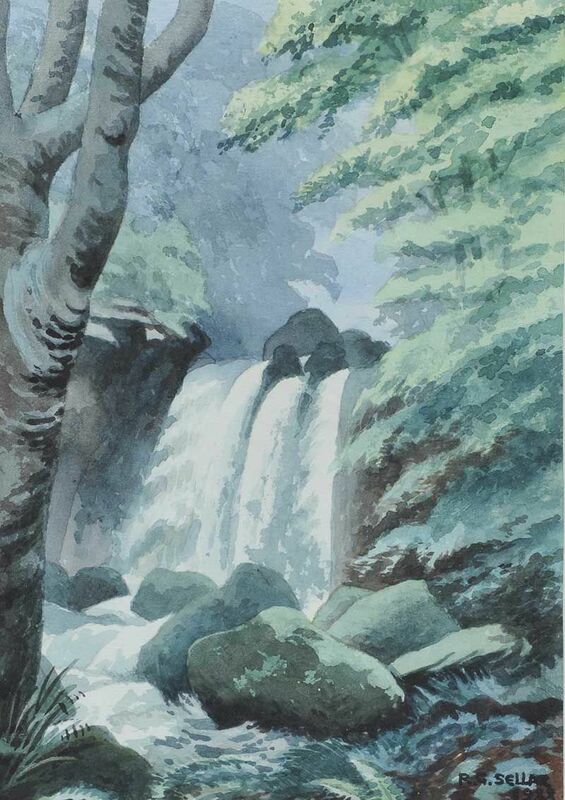 He was noted for his landscapes, portraits and murals. 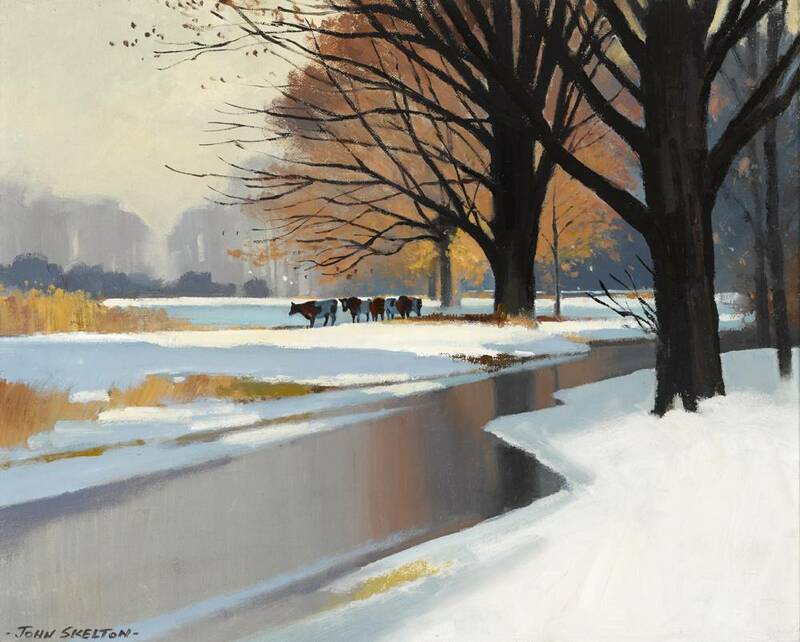 Norman Smyth was born in Belfast, and now lives and has his studio in Hillsborough, Co. Down. 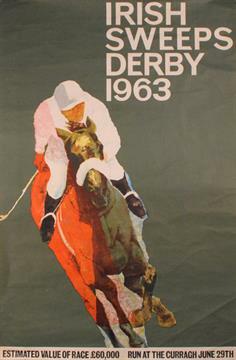 Although virtually self-taught, he studied for a time at the Belfast College of Art as a part-time student in 1950’s. Born in London. A frustrated thespian who was an accomplished amateur painter. 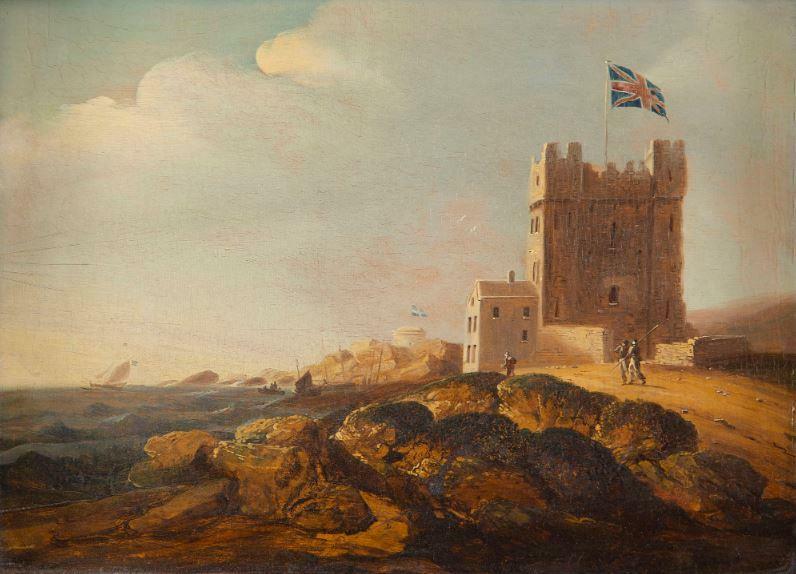 “View of Clontarf Castle” (1805) oil on canvas (24″ x 36″) sold at Whyte’s – 12/3/2012 for €9,000.00. “West Kerry Coastal Landscape” oil on board (10″ x 14″), sold at Adam’s – 13/12/2016 for €260.00. Left to right: “On Parole 1920″ oil on canvas (20″ x 17″), sold at Adam’s – 22/11/2017 for €5,200; and “The Morrow family and Frank Murphy” oil on canvas (28″ x 36″), unsold at Adam’s – 27/3/2018. Left to right: “My friend Slipper” c.1899, watercolour drawing (9″ x 6″) sold at Whyte’s 12/3/2012 for €2,000.00; and “Knockdrum, Rocks & Furze, with Cattle Grazing” oil on board (12″ x 16″), sold at Fonsie Mealy’s Dublin Sale 13/12/2016 for €600.00. 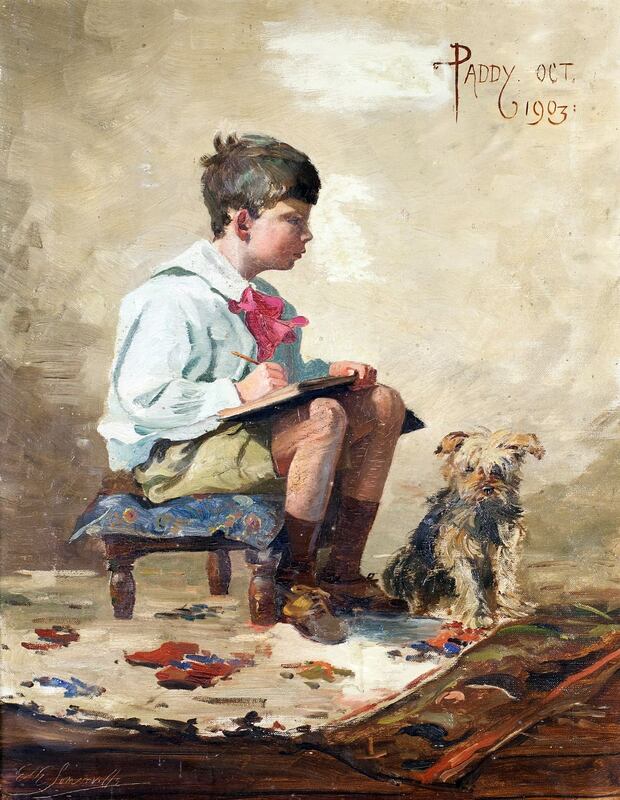 “Paddy, Oct.1903” – Patrick Coghill, nephew of the Artist, seated on a stool holding pencil and copybook, under the watchful eye of his pet Yorkshire terrier. Oil on canvas (21″ x 16″), sold at Fonsie Mealy’s Dublin Sale 13/12/2016 for €2,300. 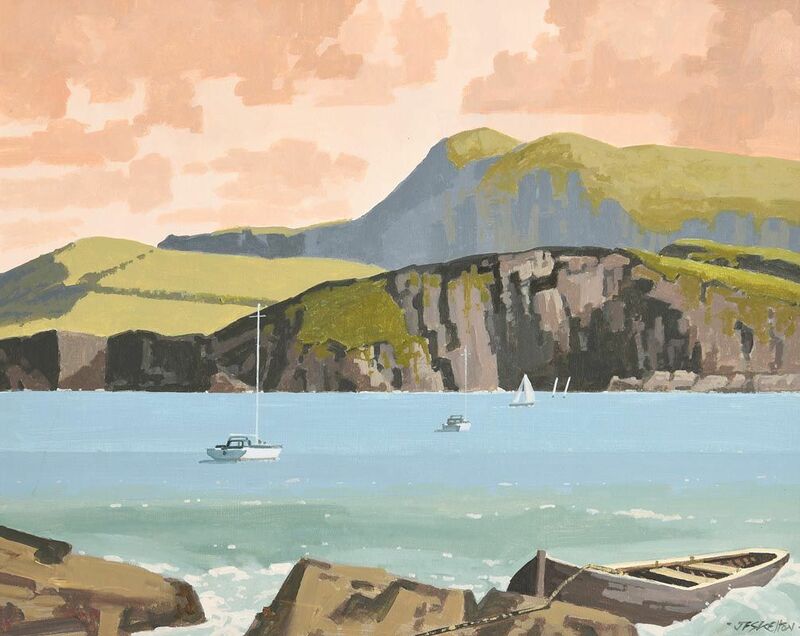 A coastal scene from Northern Ireland (?) that I dithered over and finally missed-out on. One of several by the artist that appeared on eBay in 2015. I haven’t been able to find out anything about her. 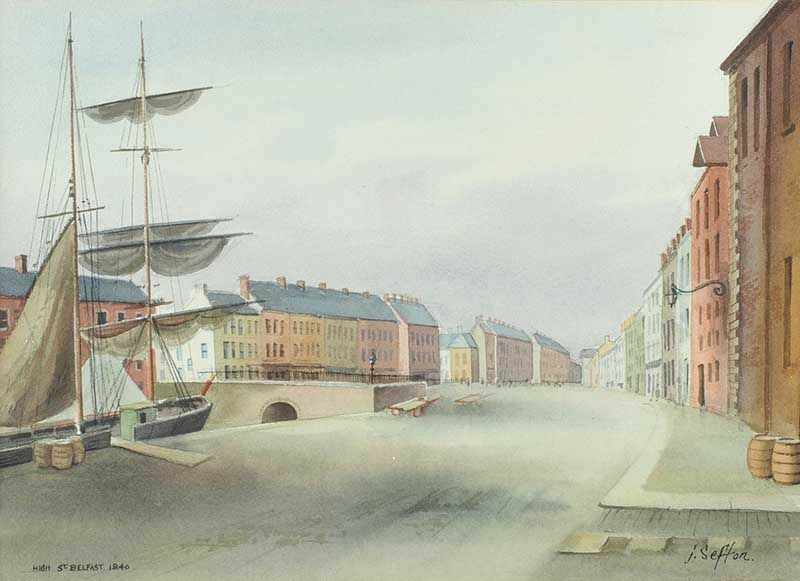 Two more watercolours by the artist: Untitled coastal scene and Bridge at Bushmills. 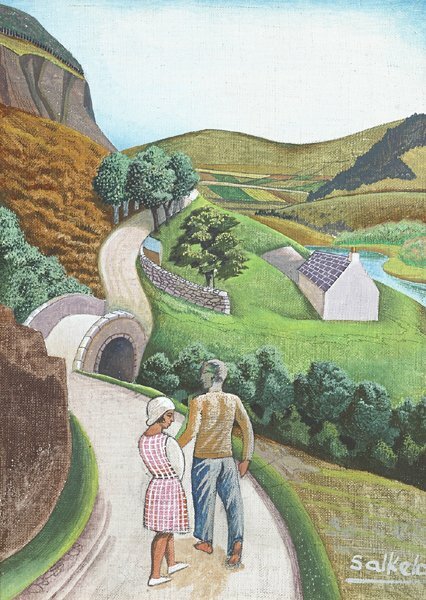 “A Brave Day in the West” oil on canvas (23.5″ x 31″), sold at Morgan O’Driscoll’s – 14/8/2018 for €420.00. Born in Portadown, County Armagh, the youngest son of Thomas H. Spence a linen manufacturer. Portrait of the artist’s mother – oil on canvas (29.5″ x 19.5″), sold online – 18/3/2017 for €230.00. 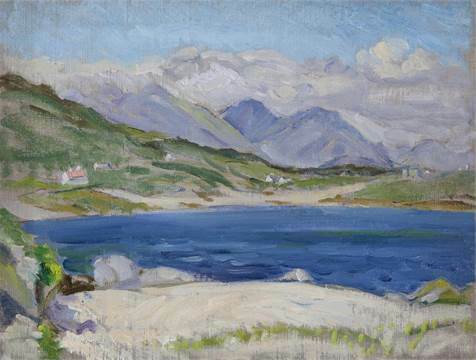 Left to right: “Evening at Connemara” oil painting (12″ x 13″), sold at Ross’s Antiques & Furniture sale – 2/2/2017 for just £30.00; and “Caragh Lake, County Kerry” dated 1952, oil on board (9.5″ x 13.5″), unsold at David Lay Auctions, Penzance – 24/1/2013. Born and raised in Belfast, in a moment of youthful indiscretion Brian chose to go to Law School. After wondering the backstreets of underachievement Brian left the law wagon and returned to his true passion: art. Brian now makes pictures, collages, commercial illustrations, labels, logos and oh, importantly, political cartoons. 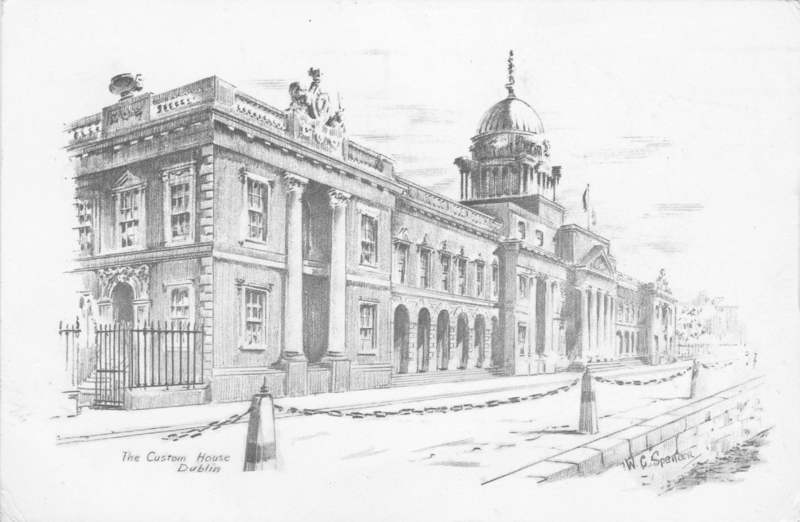 Three Dublin postcards published by the artist under the Spencer Healy Productions imprint. 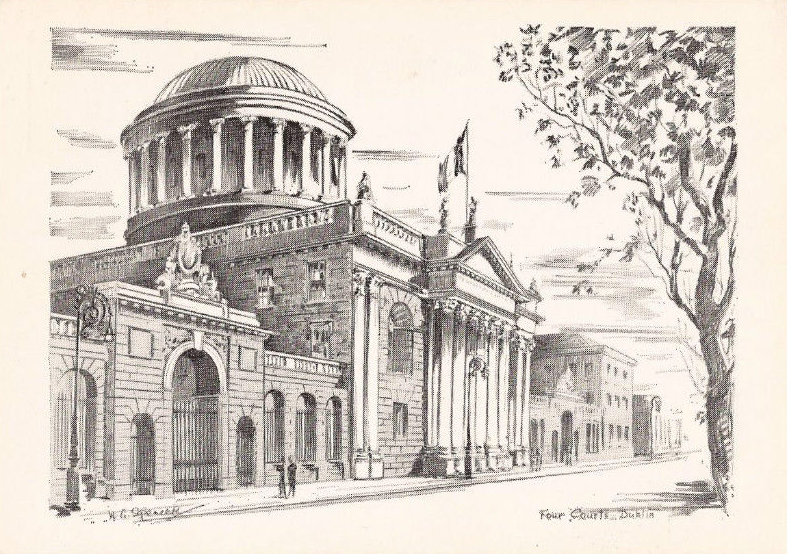 Left to right: The Custom House; The Bank of Ireland and The Four Courts. 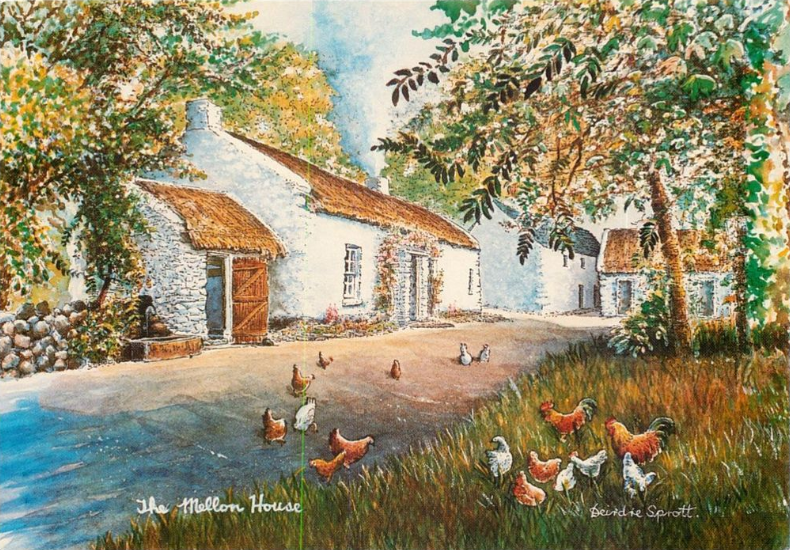 “The Mellon House at the Ulster American Folk Park at Omagh, Co.Tyrone” from a postcard. “Donegal Mountains” watercolour drawing (10″ x 14″), unsold at Ross’s – 8/8/2018. 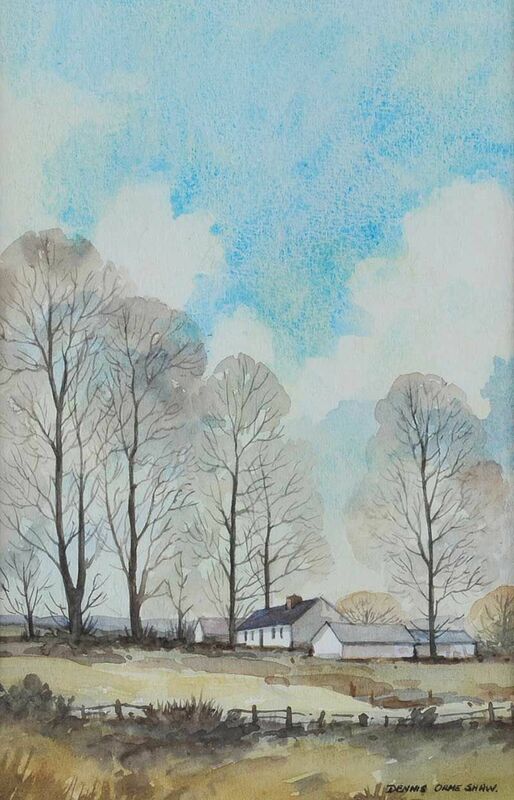 “Near Castlewellan” watercolour drawing (13″ x 20″) sold at Ross’s – 22/4/2015 for £70.00. 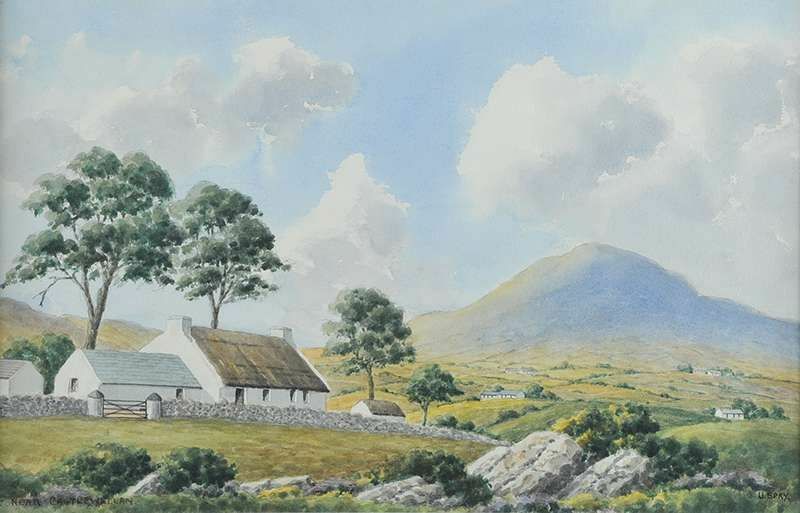 Left to right: An untitled watercolour on eBay (7/2016) – probably the Mourne mountains – and “Cushendun” watercolour drawing (7.5″ x 10.5″) sold at Ross’s – 18/5/2016 for £30.00. 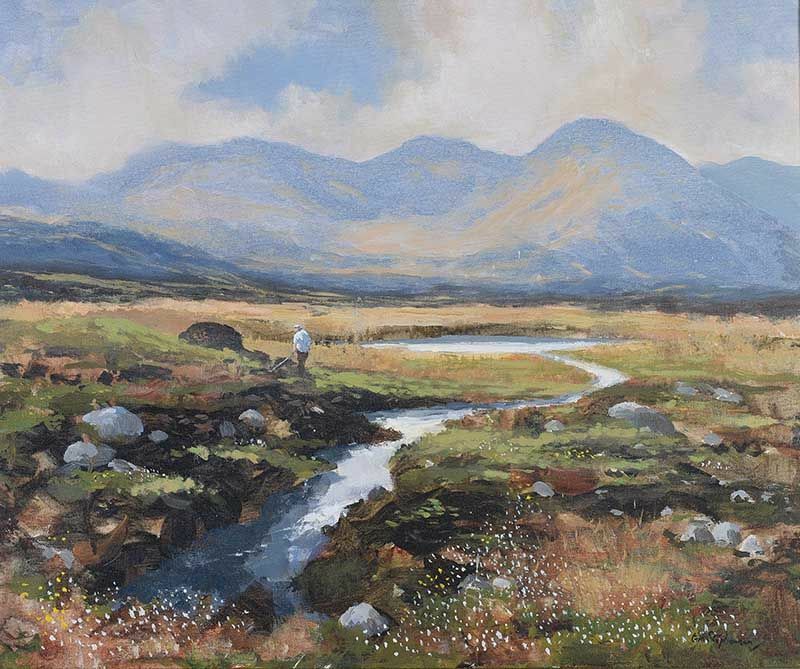 Donal Stack is an artist living and working in North Kerry. 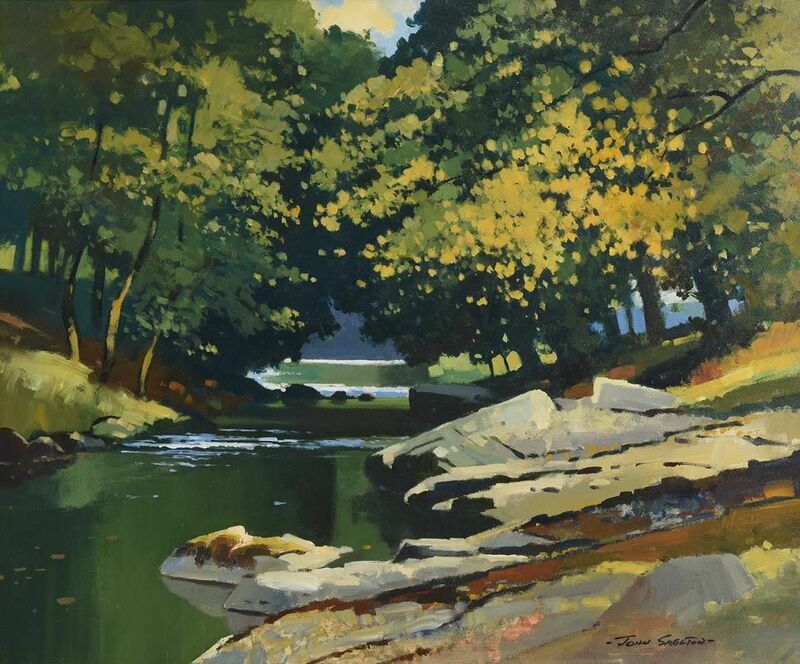 His work draws its inspiration from the landscape and heritage of his native county. 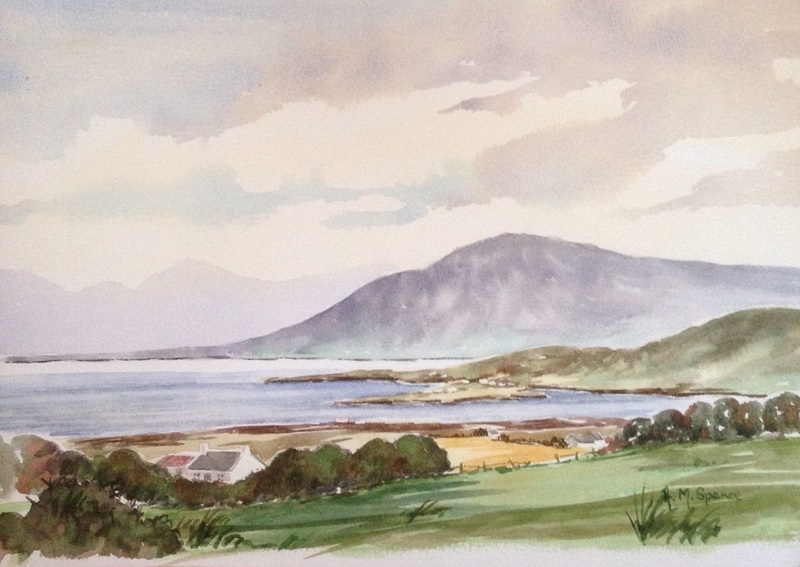 Donal accepts graphic, illustrative, and painting commissions. 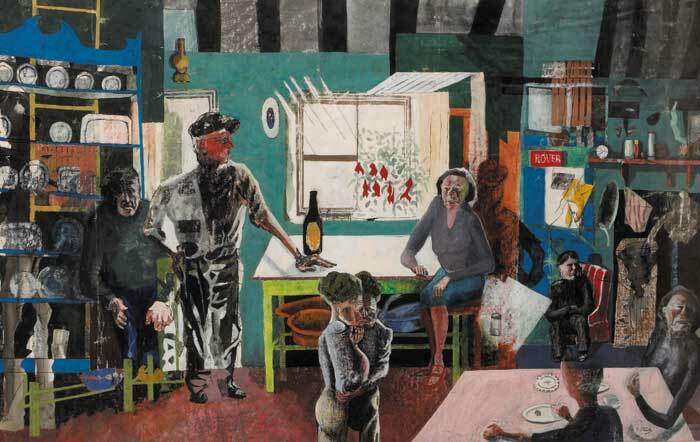 “Figures in Kitchen Interior” 1994. 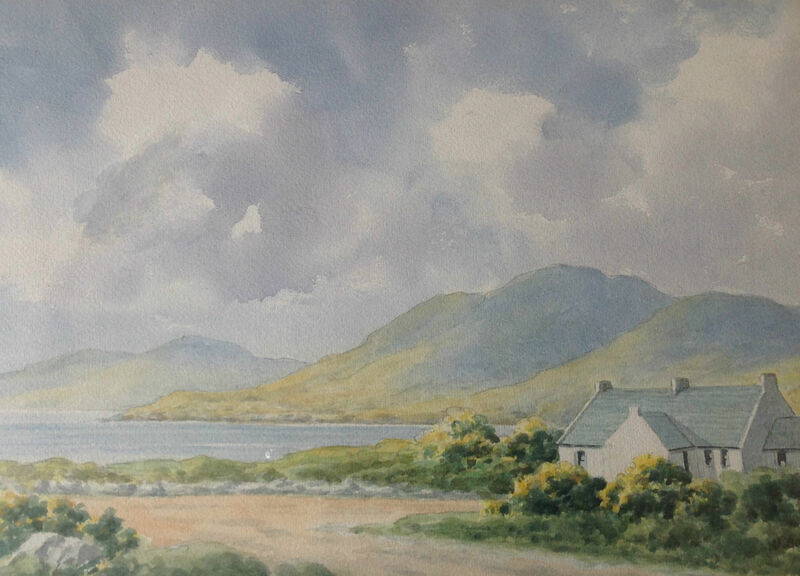 Watercolour drawing (24″ x 38.5″) sold at Whytes – for €1,300.00. 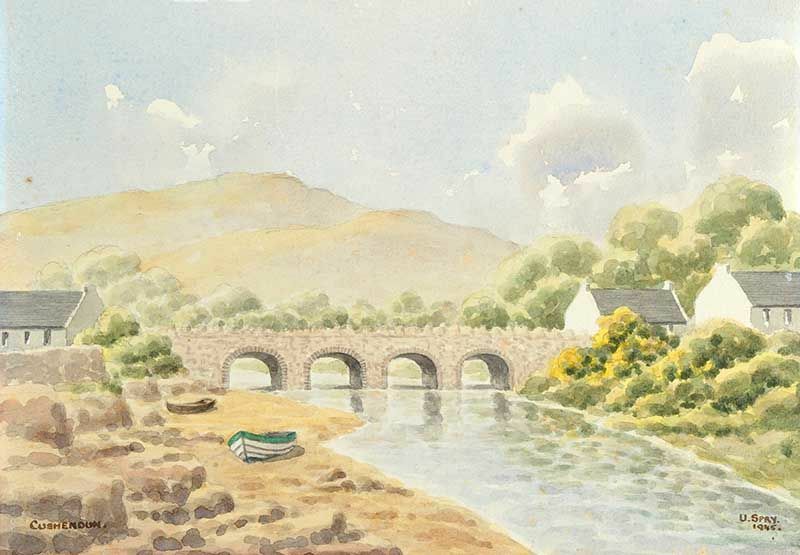 “Glenariffe, Co.Antrim” watercolour (9″ x 17″) sold at Morgan O’Driscoll’s – 8/12/2014 for €1,000.00. 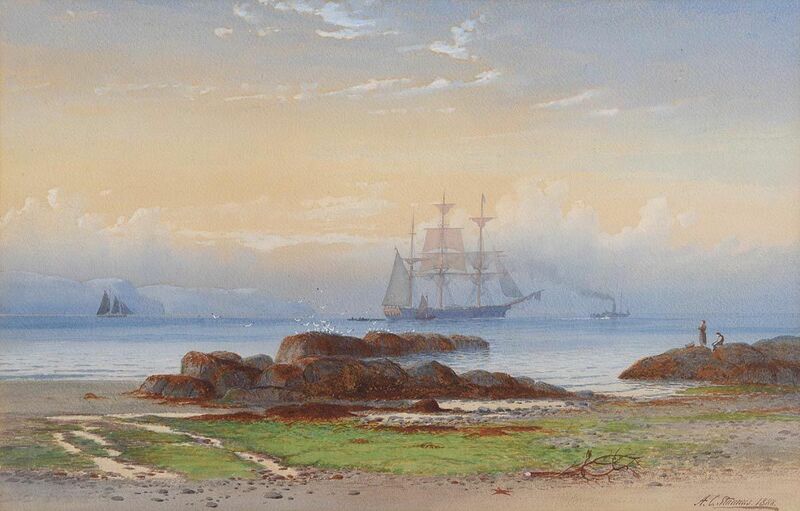 “Tall Ship Entering the Harbour” dated 1888, watercolour (13″ x 21″). Unsold at Morgan O’Driscoll’s – 2/8/2016. Youngest son of Sir Nathaniel Staples, “Ponsy” Staples was born in Dundee in 1853 but came to Lissan House near Cookstown, County Tyrone when his father inherited the Baronetcy and took up residence there in the 1870’s. His formal education had begun in 1865 when he enrolled in the Academy of Fine arts in Louvain, Belgium. 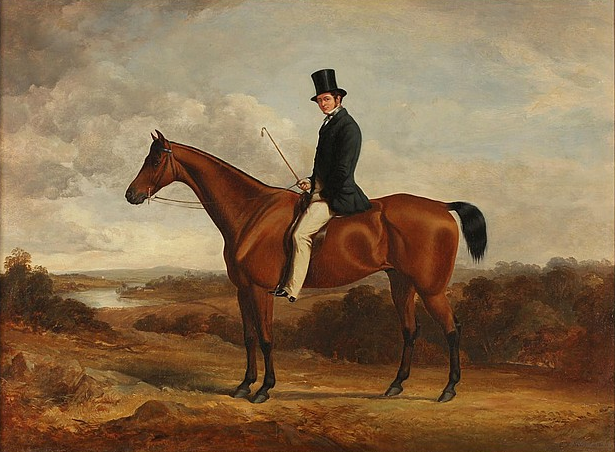 Having studied also in Paris and Brussels he eventually moved to England where, through the patronage of his cousin, Sir Coutts Lindsay, he was introduced to London society. Staples’ charm, good humour and gregarious nature won him many new friends and potential clients as well as entrée to the grandest events on the social calendar. His close friendship with Edward, Prince of Wales (later Edward VII ) is well documented and his circle of friends, many of whom were the subjects of his art, reads like a Who’s Who of the great and the good including Oscar Wilde, Sarah Bernhardt, William Morris, Mark Twain, George Bernard Shaw, Yvette Guilbert and Lily Langtry! Staples was a portraitist of some renown and there are currently six of his paintings hanging in the National Portrait Gallery in London. 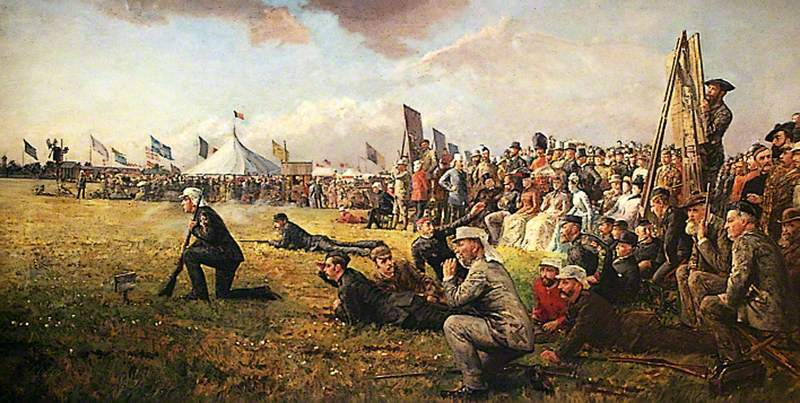 “The Last Shot for the Queen’s Prize, Wimbledon” Photo: Worthing Museum and Art Gallery. 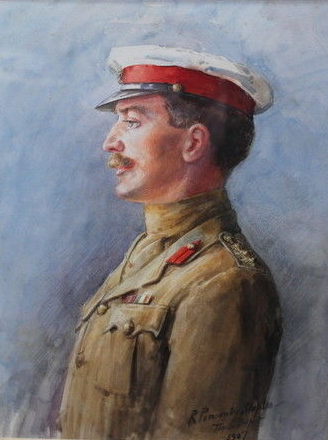 “Father on returning from Africa” 1907, watercolour portrait of Captain Sir George Ponsonby Staples – offered for sale on eBay in June 2018. 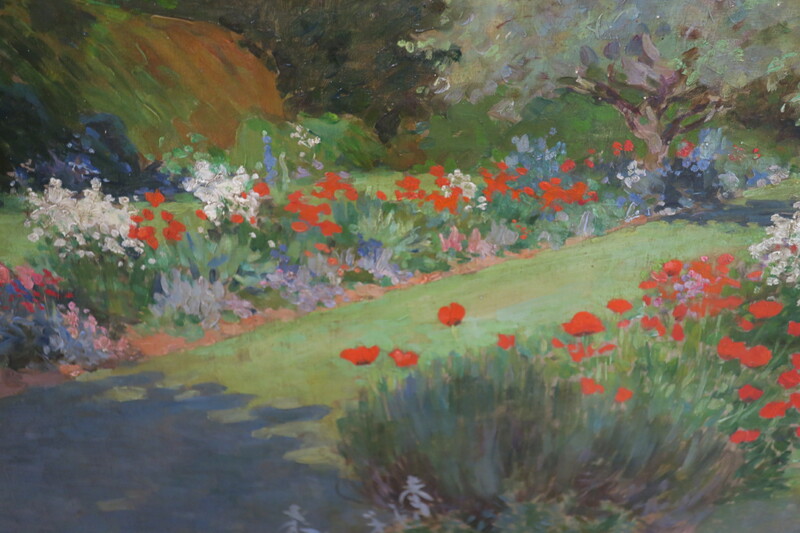 “The Poppy Garden” oil on canvas (18″ x 22″), sold at Mullen’s, Laurel Park – 7/1/2019 for €580.00. 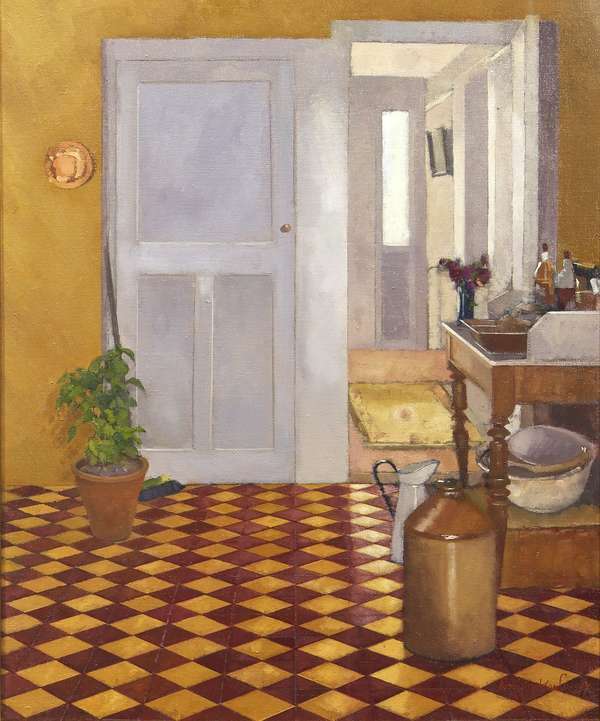 “The Artist’s Kitchen” oil on canvas (24″ x 20″) sold at Adams – 29/9/2012 for €1,800.00. 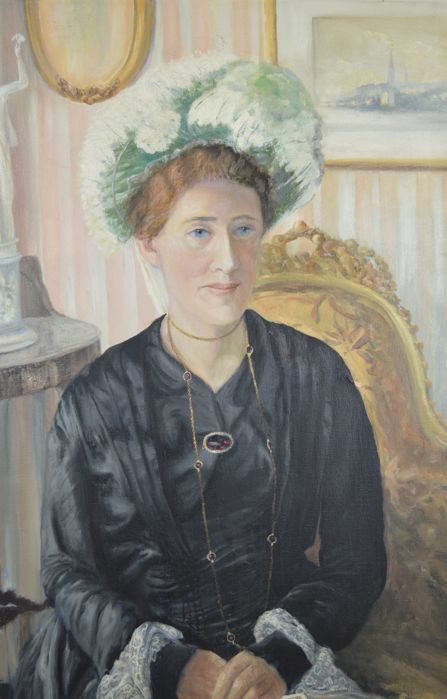 “Portrait of a woman” – oil. 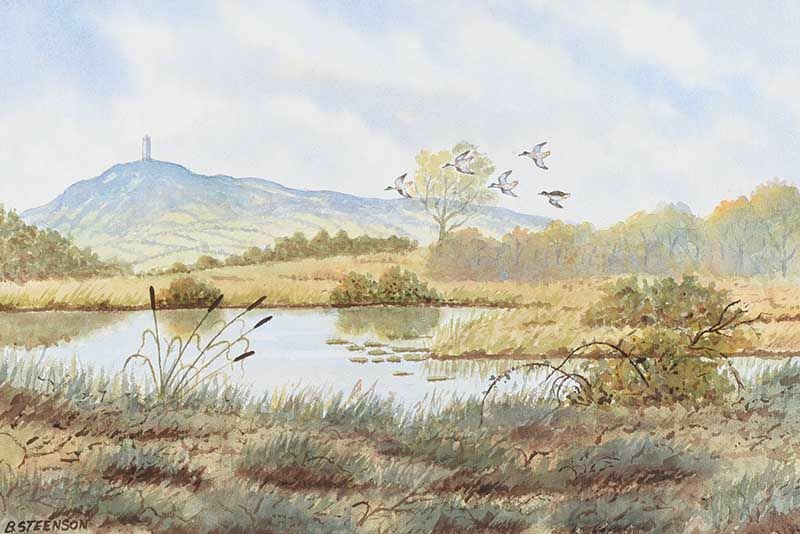 “Scrabo Tower, County Down” watercolour drawing (14″ x 21″), sold at Ross’s – 13/2/2019 for £20.00. 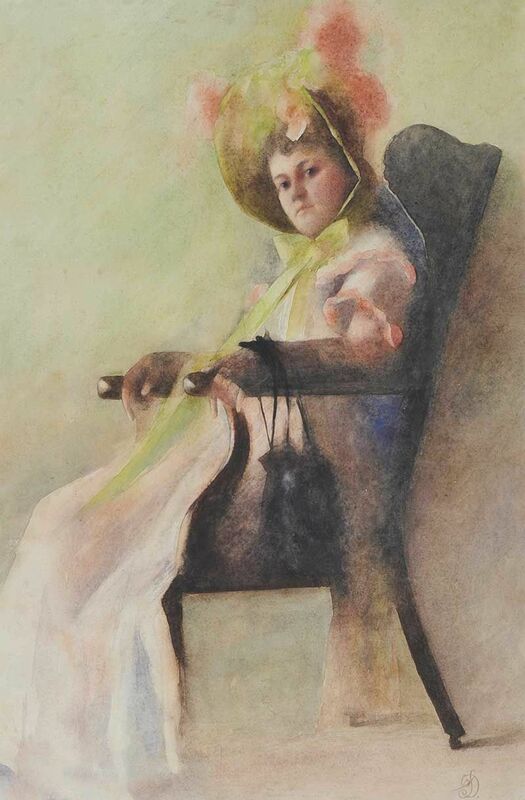 “Seated Lady” watercolour drawing (26″ x 17″), unsold at Ross’s 9/11/2016. Born in Dublin. 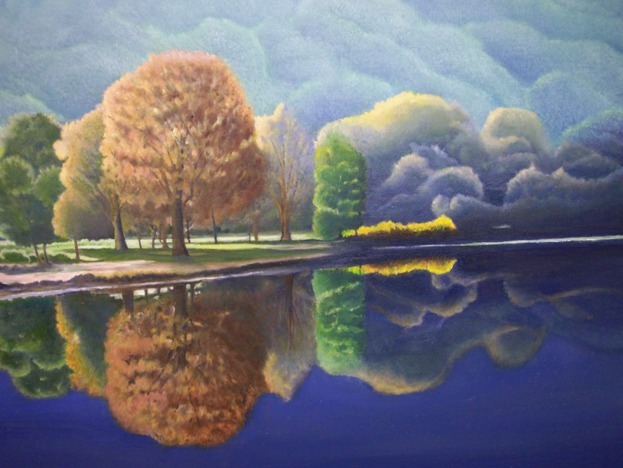 Landscape and Portrait Artist. 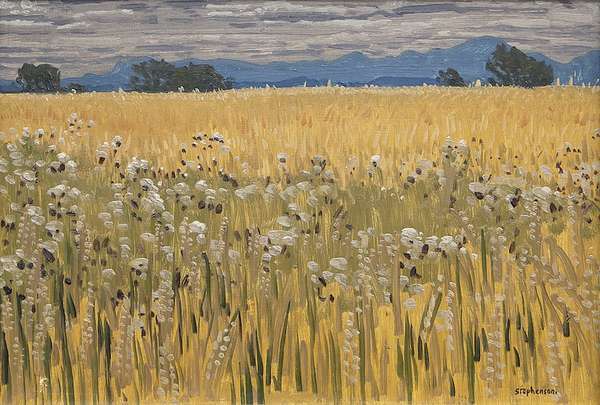 “Ripening Corn” oil on board (15″ x 21″), sold at Adam’s – 16/12/2014 for €1,400.00. 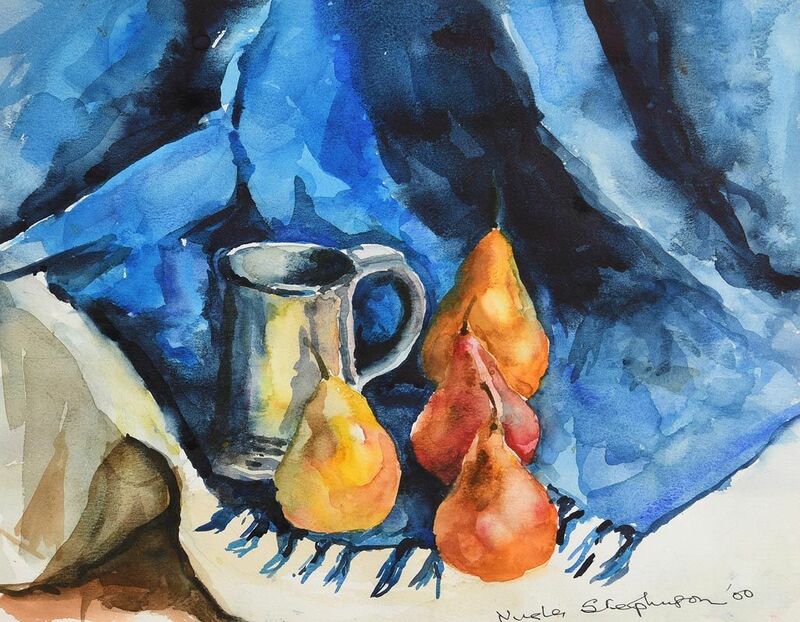 “Pewter Tankard and Pears” watercolour (11″ x 14″), sold at Morgan O’Driscoll’s – 2/7/2018 for €90.00. Carrickfergus based artist and gallery owner. 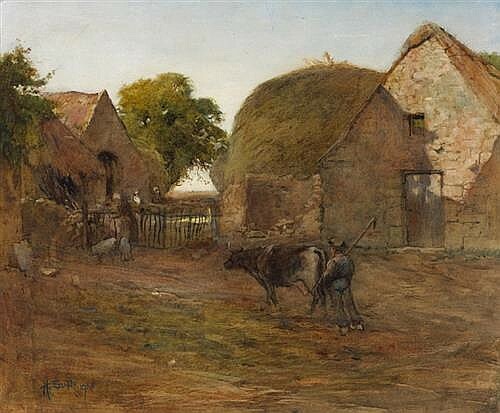 A traditional landscape artist also noted for his ‘sheepy‘ paintings under the pseudonym Thomas Joseph. “Crawfordsburn Glen in the Autumn” oil on board (12″ x 16″), sold at Ross’s – 5/10/2016 for £50.00. “Digging Turf” oil on canvas (20″ x 24″), sold at Ross’s – 6/12/2017 for £100.00. 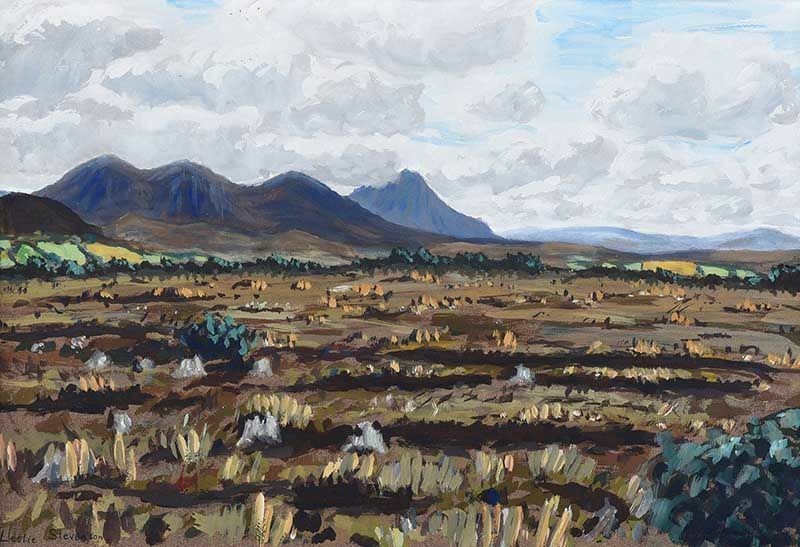 “Mountains, Donegal” gouache on board (12″ x 18″), sold at Ross’s – 8/8/2018 for £40. 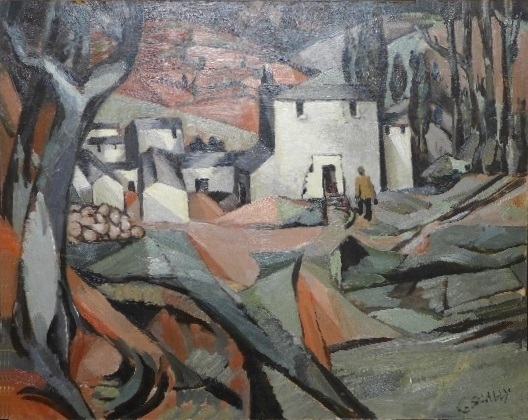 Patric Stevenson was born in Sussex and was educated at Methodist College, Belfast, and from 1926 to 1928 studied at the Belfast School of Art, and later at the Slade School, London. 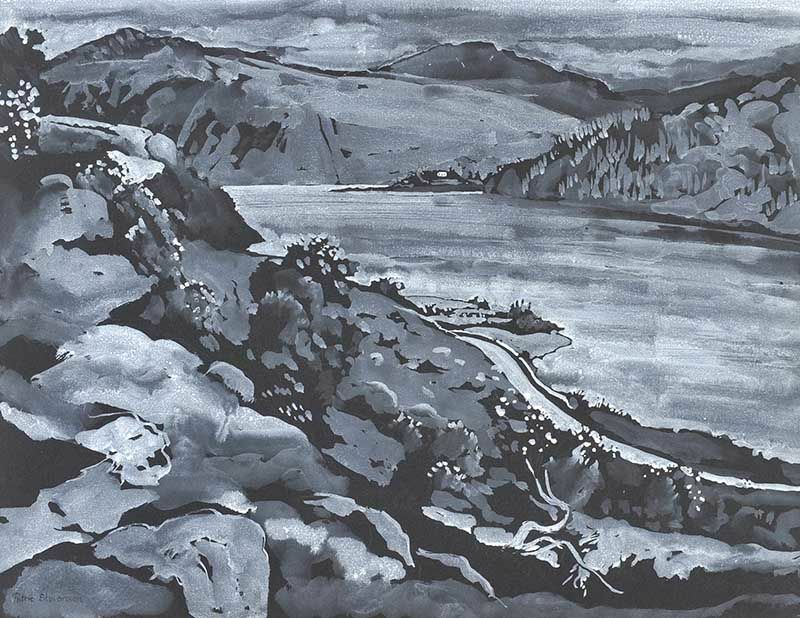 “Lough Dan, County Wicklow” watercolour drawing (19″ x 25″), sold at Ross’s – 28/6/2017 for £50.00. 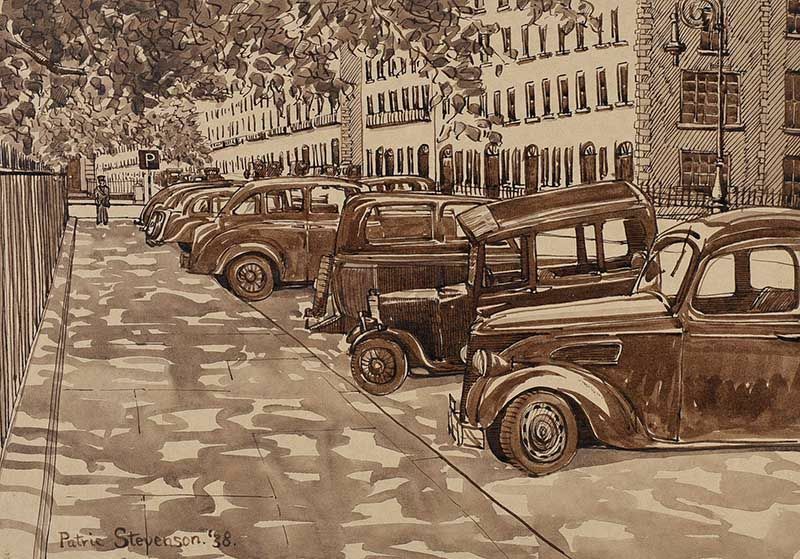 “Car Park, Merrion Square West, Dublin” dated 1938, watercolour drawing (11″ x 15″), sold at Ross’s – 13/9/2017 for £70.00. 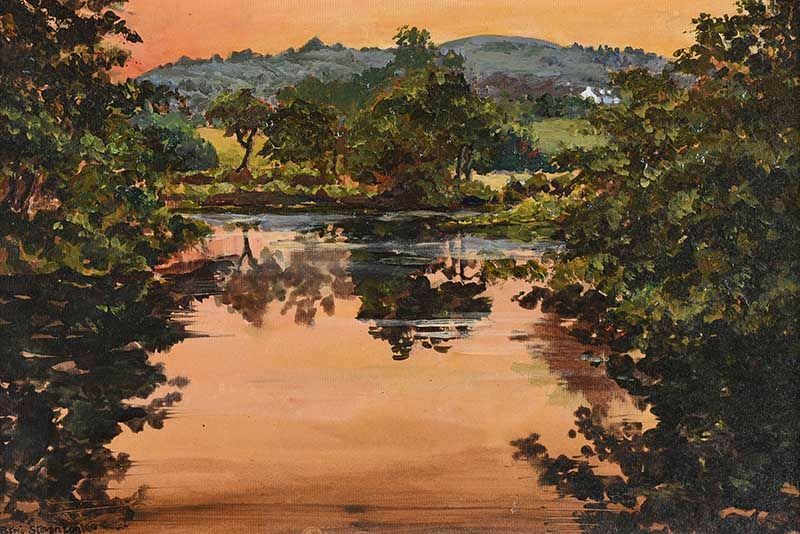 “The River Lennon at Sunset near Ramelton” acrylic on board (12″ x 19″), sold at Ross’s – 11/10/2017 for £120.00. 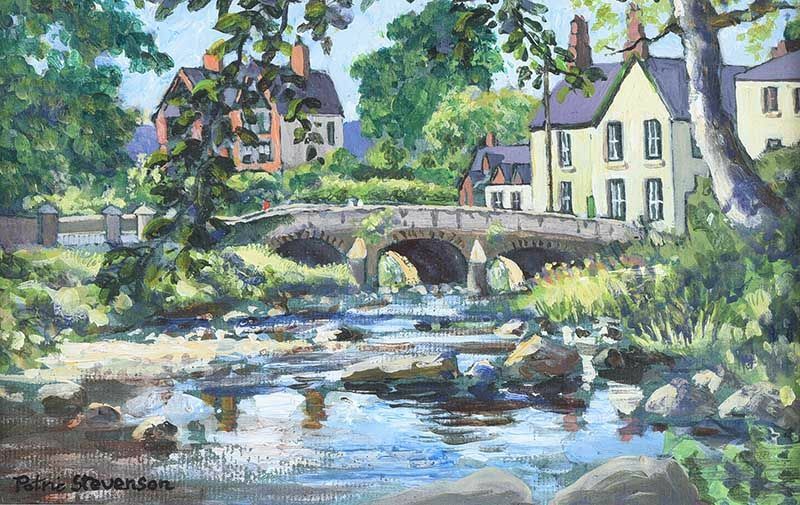 “The Bridge, Rostrevor” acrylic on board (6″ x 9″), sold at Ross’s – 13/2/2019 for £40.00. 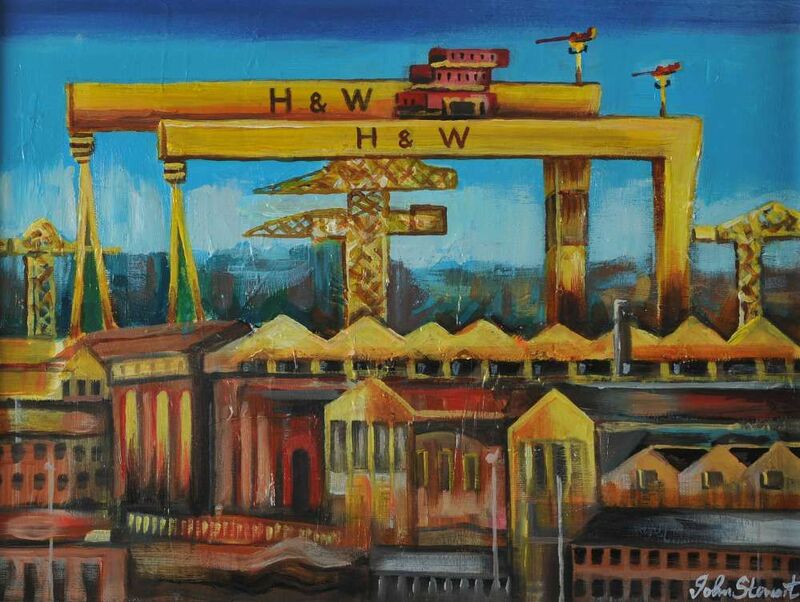 “Industrial Belfast” oil on canvas (12″ x 16″) sold at Ross’s – 29/1/2015 for £150.00. 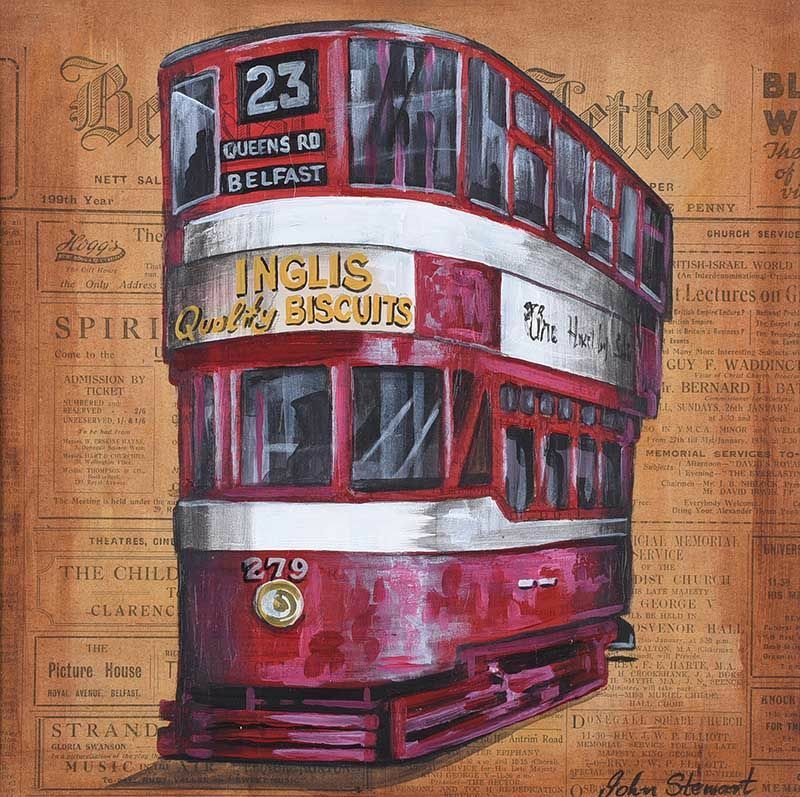 “Belfast Tram” acrylic on newspaper (11″ x 11″), unsold at Ross’s – 6/12/2017. 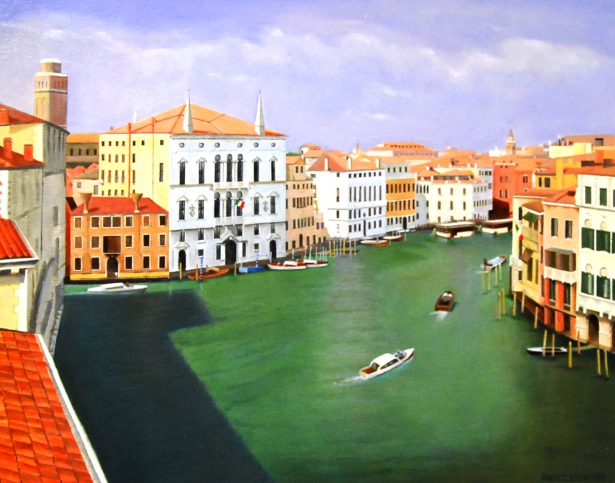 “The Grand Canal, Venice” oil on board (15.5″ x 19.5″). 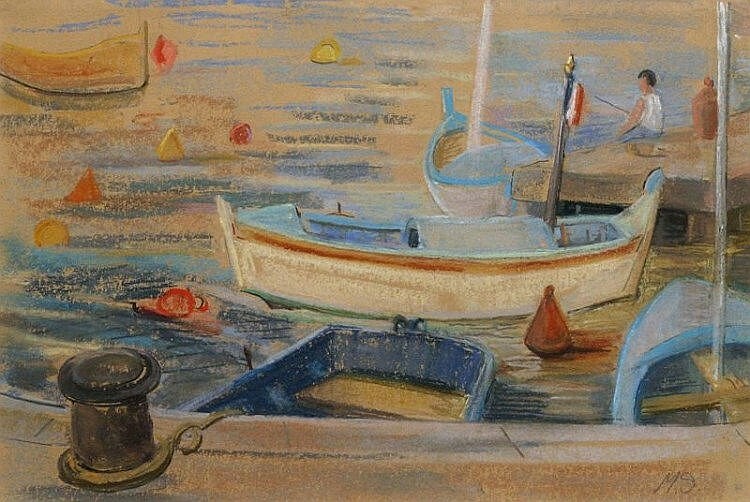 “Harbour near Cannes” pastel (10″ x 15″), sold at Gormley’s – 18/11/2014 for £50.00. “Rossmoney“, oil on board (17.5″ x 13.5”). 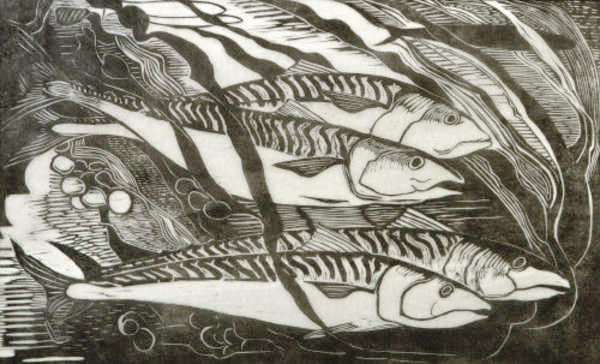 Mackerel woodcut (10″ x 16″) sold at Adam’s – 28/3/2012 for €360.00. 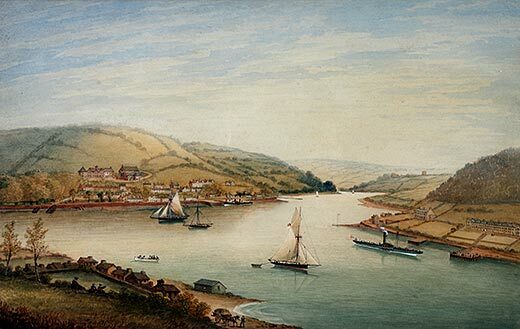 “Cork Harbour from St. Aubyn’s” c. 1870, watercolour (24″ x 47″). 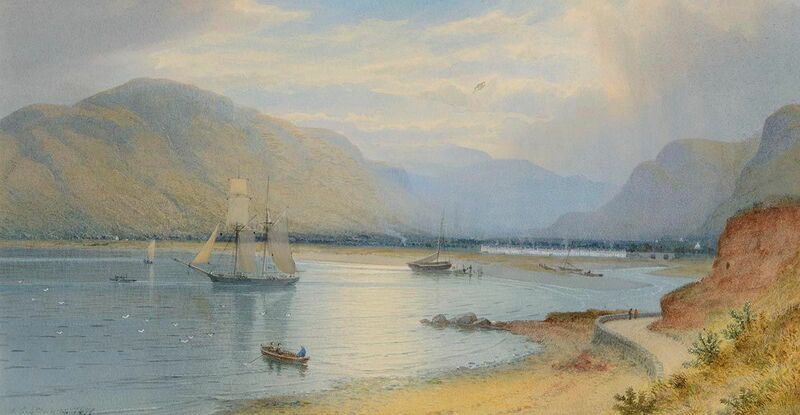 “Crosshaven, Co.Cork” c.1870, watercolour (22″ x 29″). 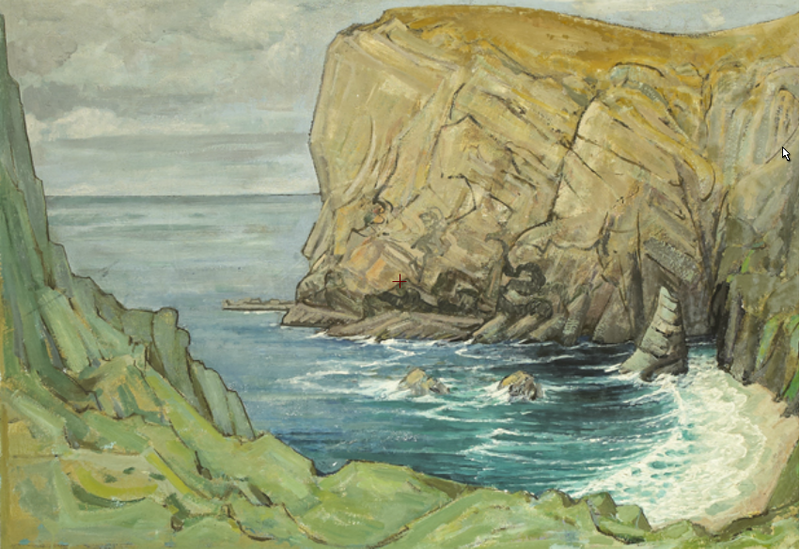 Both in the permanent collection of the Crawford Art Gallery, Cork. “View from the Fields” oil on canvas (21″ x 29″), sold at Ross’s – 13/2/2019 for £43.00. 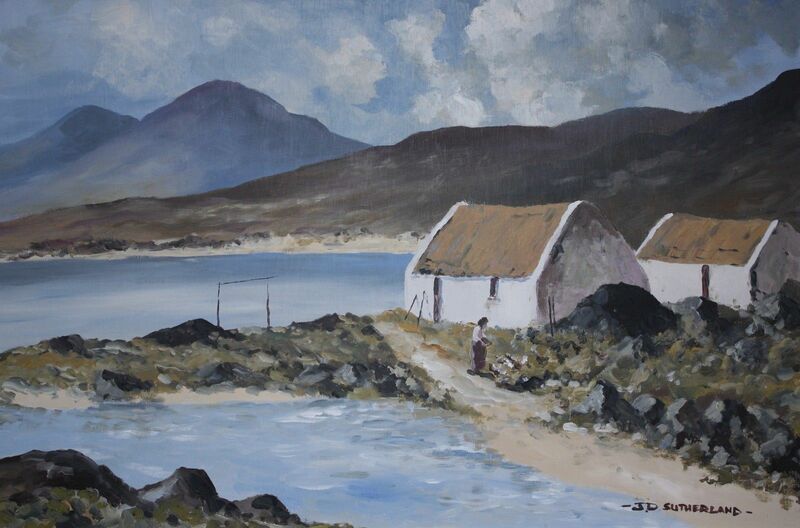 “West of Ireland Landscape” oil on canvas (31.5″ x 36.5″), sold at Adam’s – 28/1/2014 for €320.00. 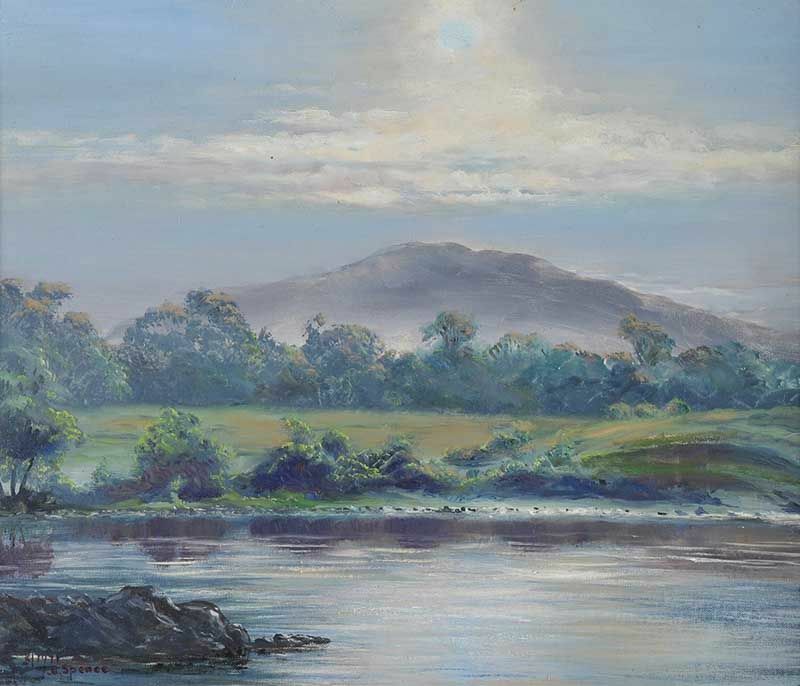 Left to right: “Derrymore, Connemara” oil on board sold at Adams – 26/2/2008 for €340.00; and “River Mooring” pastel on paper (14″ x 22″). 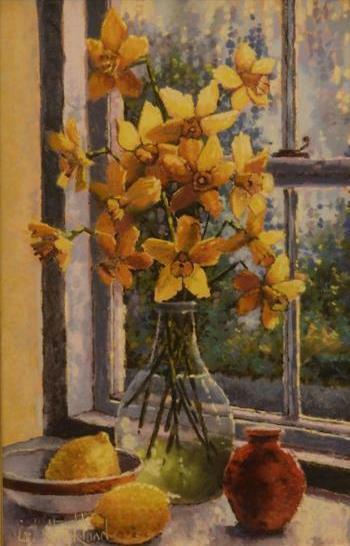 “Window Daffodils” pastel on paper (16.5″ x 11″), sold at Herman & Wilkinson – 28/9/2018 for €130.00. 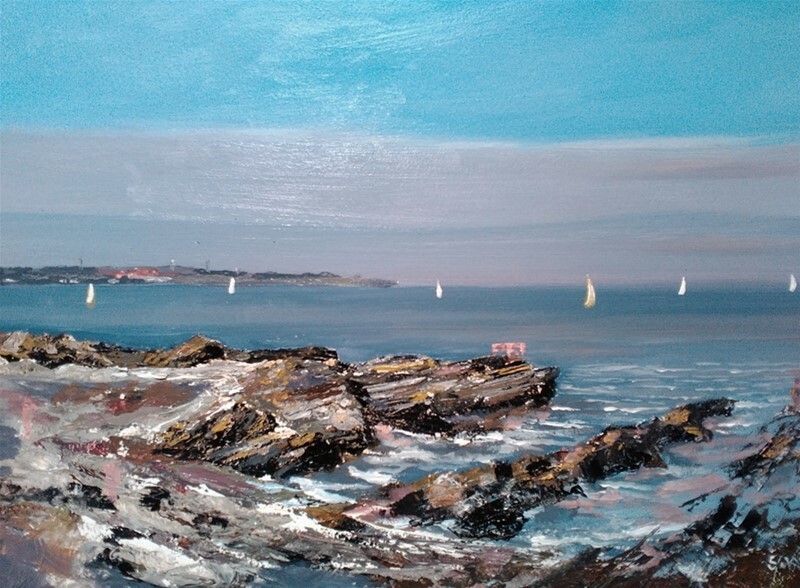 Kildare artist specialising in seascapes and landscapes. 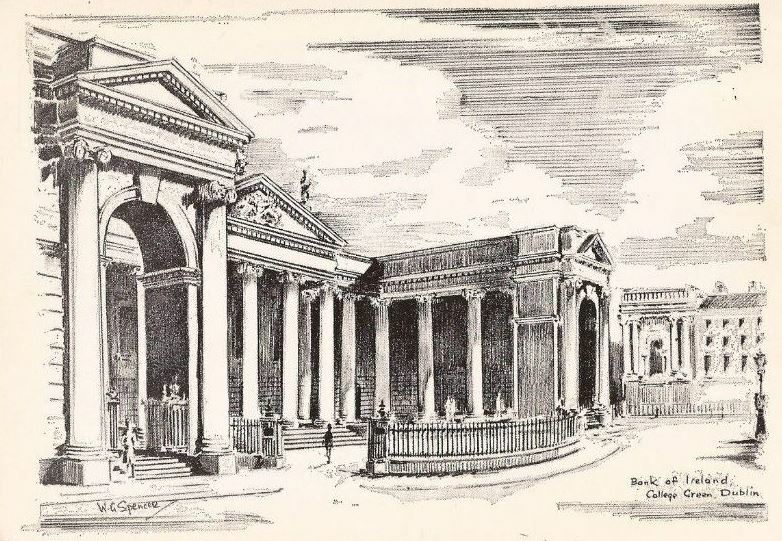 Exhibits at St.Stephen’s Green and Merrion Square. 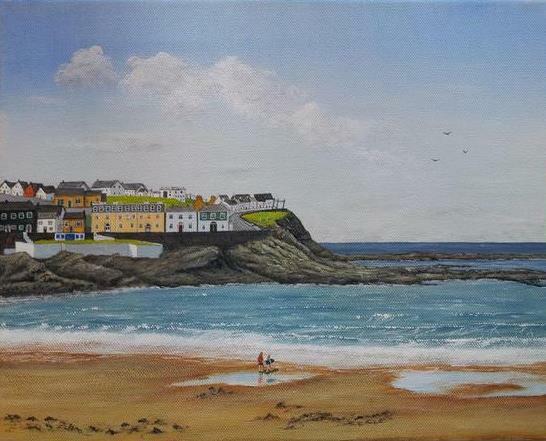 “Ballybunion, Co.Kerry” (10″ x 12″). 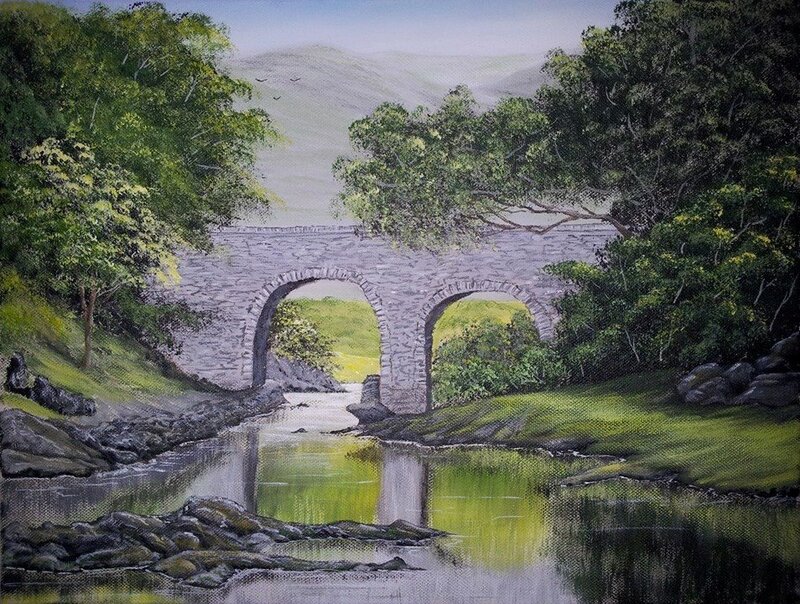 Left to right: “The Old Weir Bridge, Killarney” acrylic (12″ x 15.5″); and “Kilkee” acrylic (11″ x 13.5″). 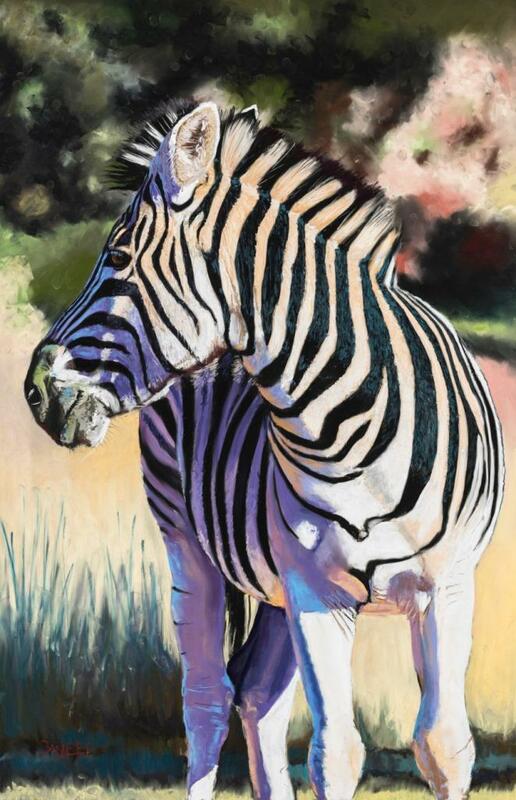 Painter and writer, born in Australia, but spent her early years in Kenya where her parents were missionaries. 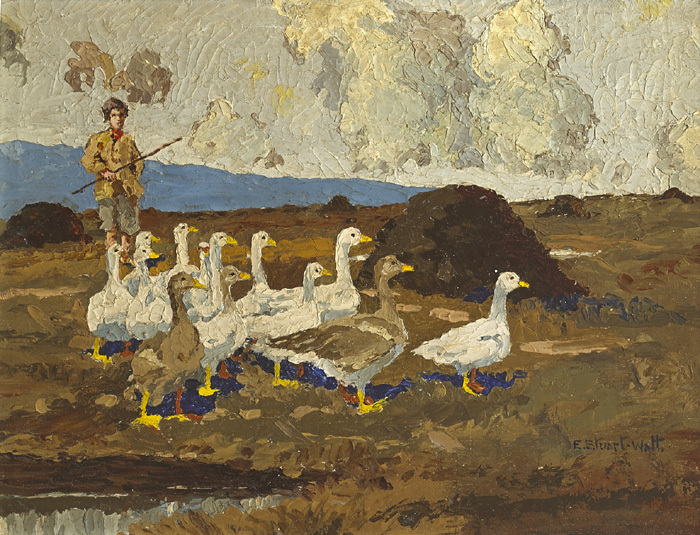 “The Goose Laddie” oil on canvas board (12″ x 16″), sold at Whyte’s – 23/2/2015 for €640.00. 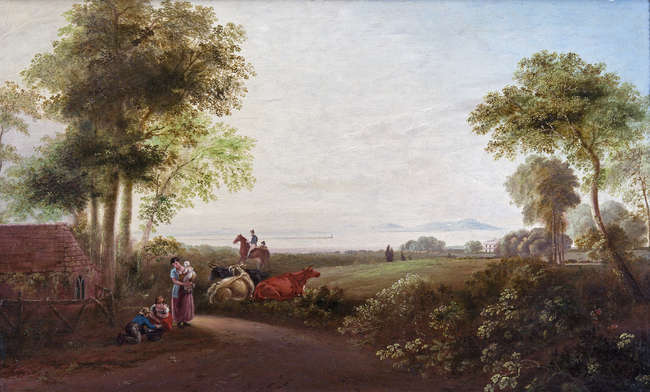 “Galtee More” 1847, oil on canvas (14″ x 18″) – note on reverse ‘Bred by J.Gubins, Knocklong‘, sold at Fonsie Mealy’s – 11/7/2018 for €170.00. 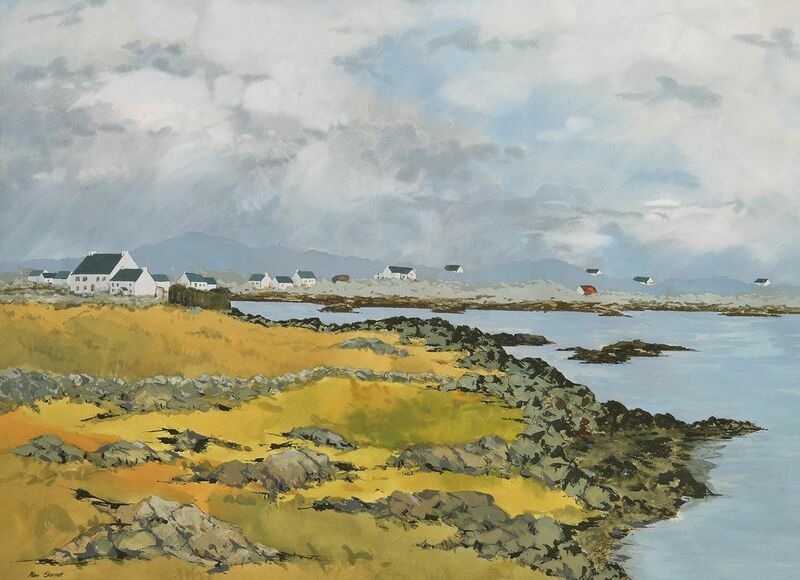 “Irish Cottages” oil on board (26″ x 36″). 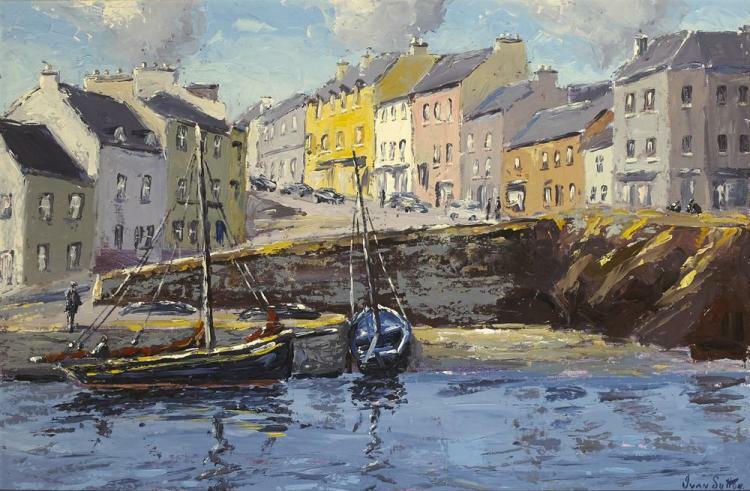 “Roundstone Harbour, County Galway” oil on board (20″ x 30″), sold at Whyte’s – 26/9/2016 for €1,150.00. 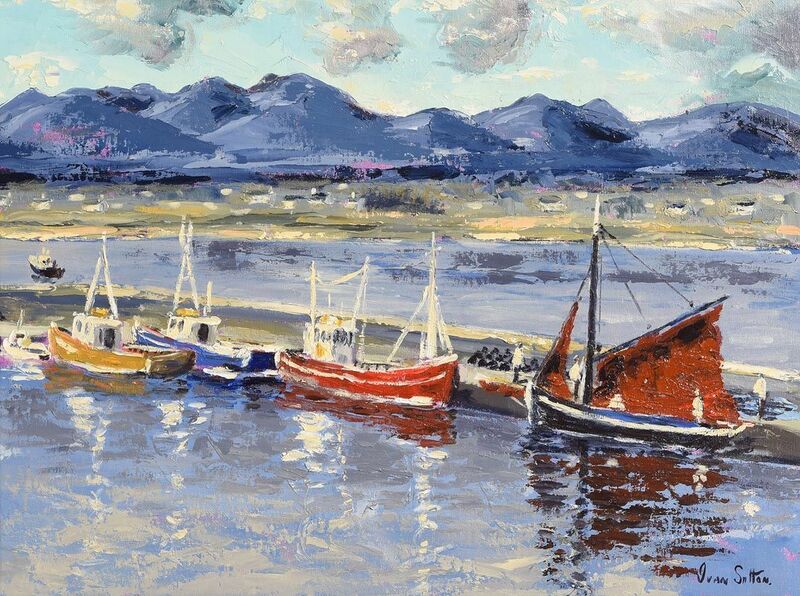 “Roundstone Harbour, Co.Galway” oil on board (18″ x 24″) sold at Morgan O’Driscoll’s – 2/8/2016 for €1,200.00. 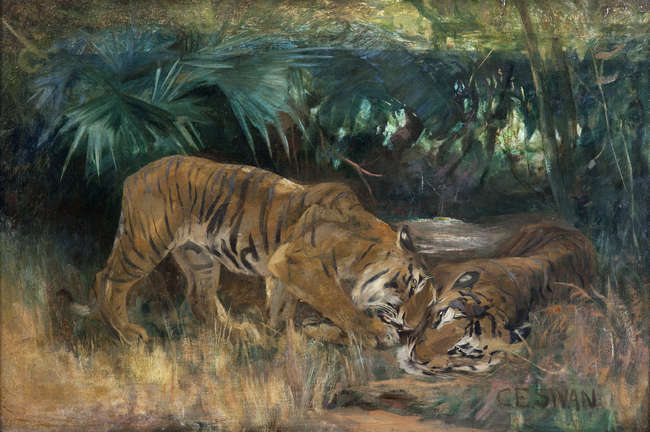 “Bengal Tigers” oil on canvas (19¾” x 29½”) sold at Adams – 23/3/2016 for €3,000. Olive Swanzy, was born in Cannes in the south of France, the daughter of the Reverend Thomas Biddall Swanzy, (Church of Ireland), of Newry, County Down. 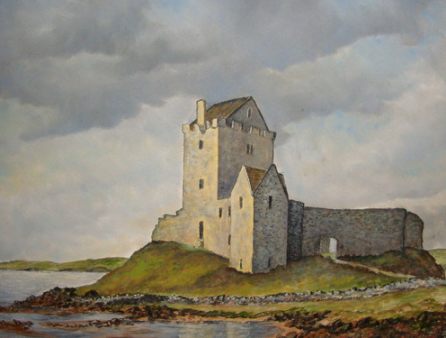 The Swanzy family, originally from Lancashire, had been in Ireland since the 1600s. At the outbreak of WW.I. Olive joined the Voluntary Aid Detachment (VAD) nurses and went off to serve at the Western Front. There she tended to soldiers who had been terribly wounded and saw things that nobody should have to see. During that time she made a collection of autograph books, filled with poems, sketches, drawings, stories and cartoons, reflecting the thoughts and fears of soldiers who had been wounded in active service. 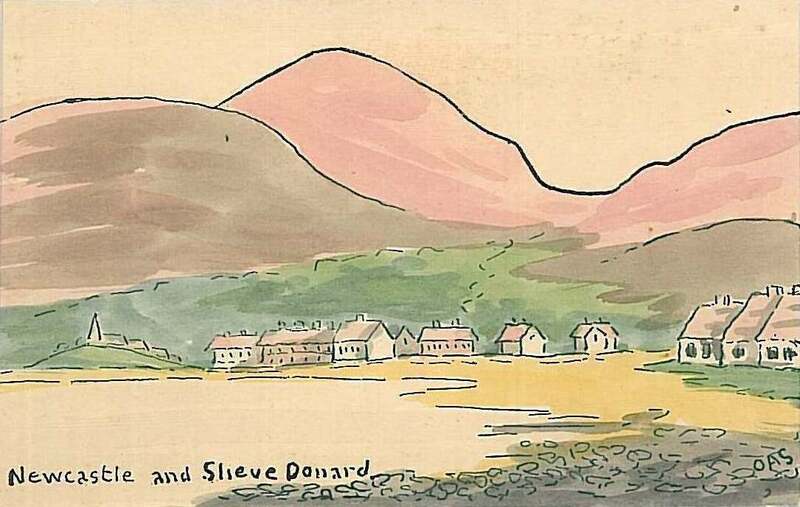 After her death, a box of these autograph books and art was discovered in the attic of her home in Rostrevor and this turned out to be such a trove of material that much of it has been on display to the public at the Ulster Museum. Irish writer Carlo Gébler wrote an acclaimed play, ‘The Box‘, based on the collection and story of Olive Swanzy’s wartime experiences. She never married and continued nursing when she returned from the Western Front, becoming the Matron of Newry Hospital, where she served throughout WW.II. She was prominent in the local St John’s Ambulance Brigade and taught at Sunday School. 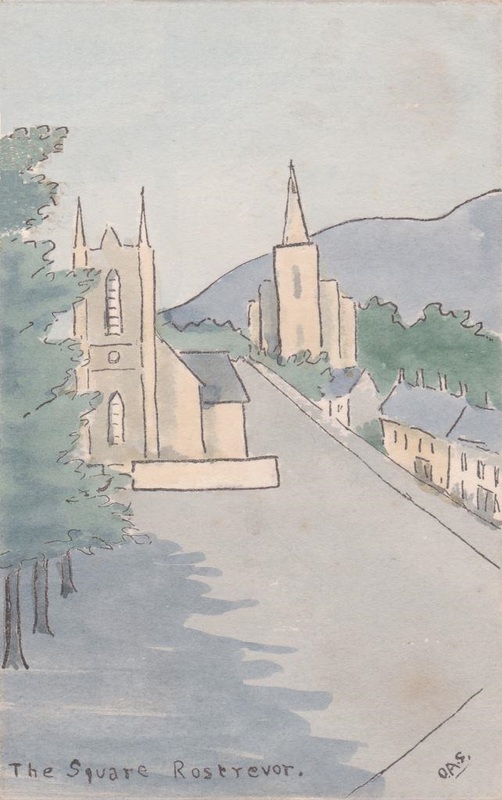 In later years she seems to have started some sort of a postcard ‘cottage industry’ and turned out a charming range of hand-coloured cards of County Down. 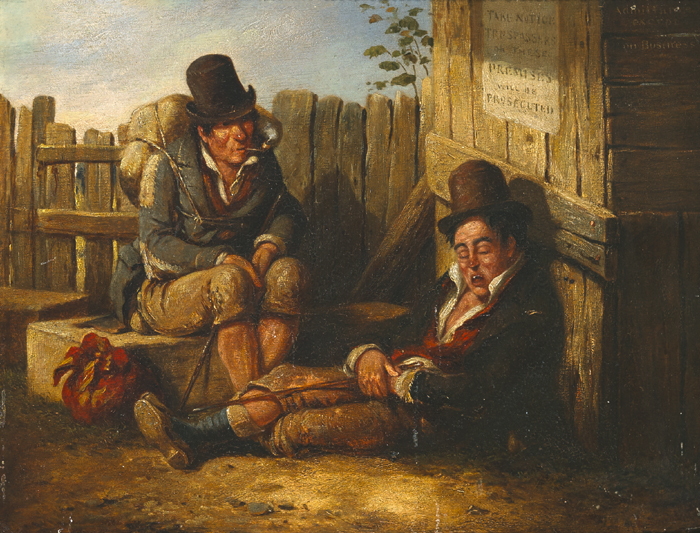 These are scarce but are just about the only way of acquiring the artist’s work. They are simple drawings and must have been printed with just the outline and the artist painstakingly colouring in each card as there are subtle differences in cards of the same scene. Even though these hybrids are not original paintings they are something special and it’s nice to think of the old lady actually hand-painting each card! 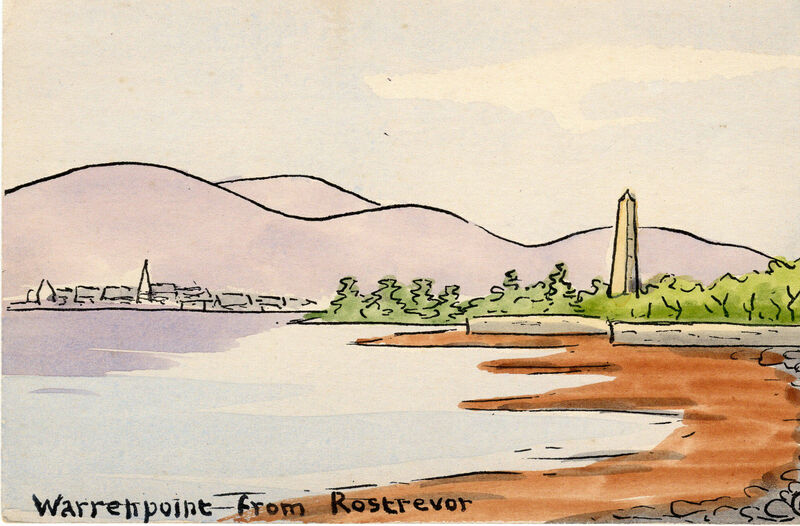 In recent months I was fortunate to pick up what is probably an original painting intended for a card but not a postcard – ‘The Square, Rostrevor‘ below. David Sweet is an artist living in Belfast. In his day job, he works as a paediatrician at the Royal Maternity Hospital in Belfast. 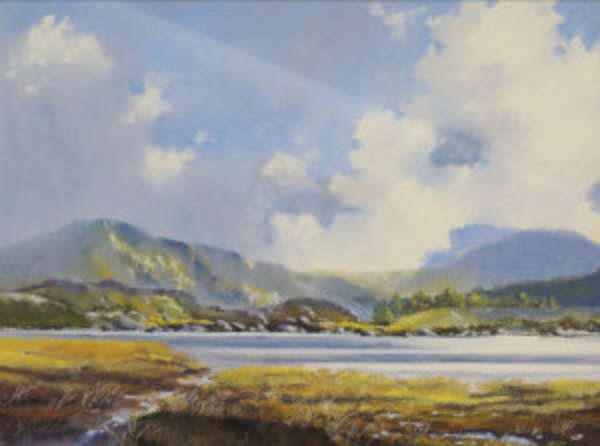 He works mainly in soft pastel and is a member of the Pastel Society of Ireland. 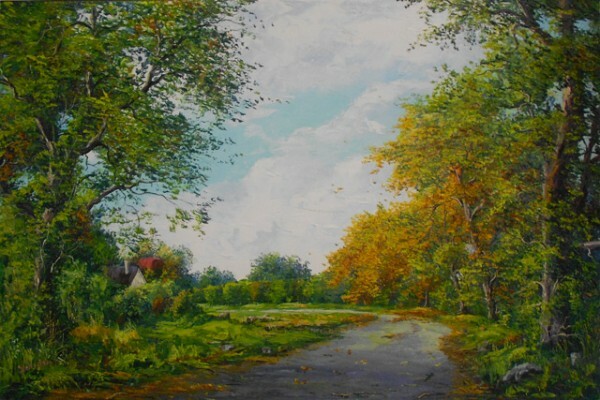 David is happy to undertake commissions – see website. “Punda” soft pastel on fine sanded paper (33.5″ x 23.5″). 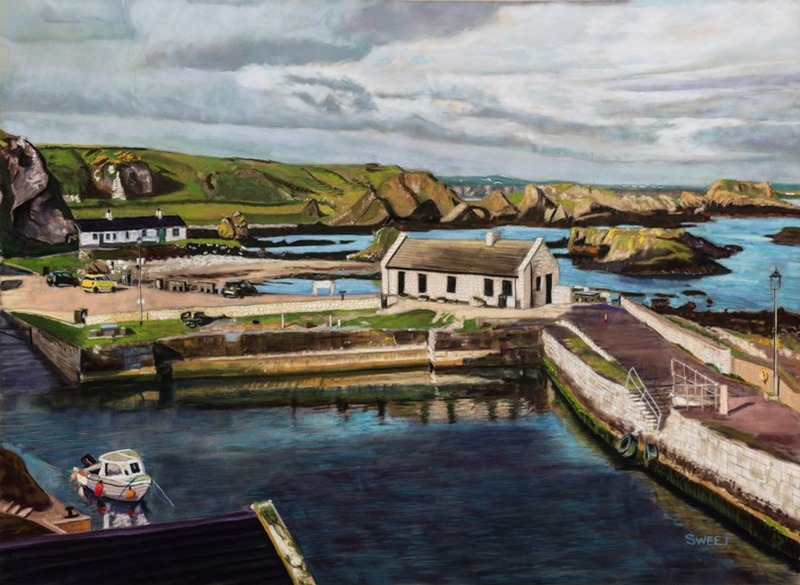 “Ballintoy” soft pastel on velour (27.5″ x 39″). 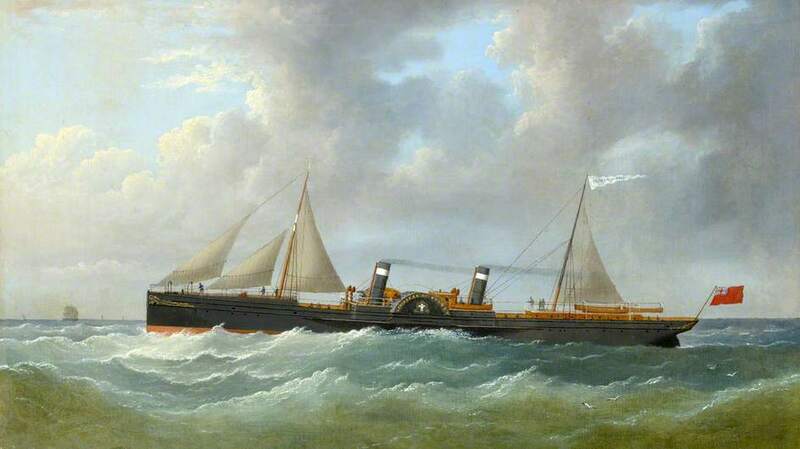 Born in Dublin, eldest daughter of Patrick Swift (see next listing below) and Oonagh Ryan, she moved with her family to the Portuguese Algarve at six years of age. She showed an early flair for painting and after attending boarding school in England went on to study Art in London and Lisbon. 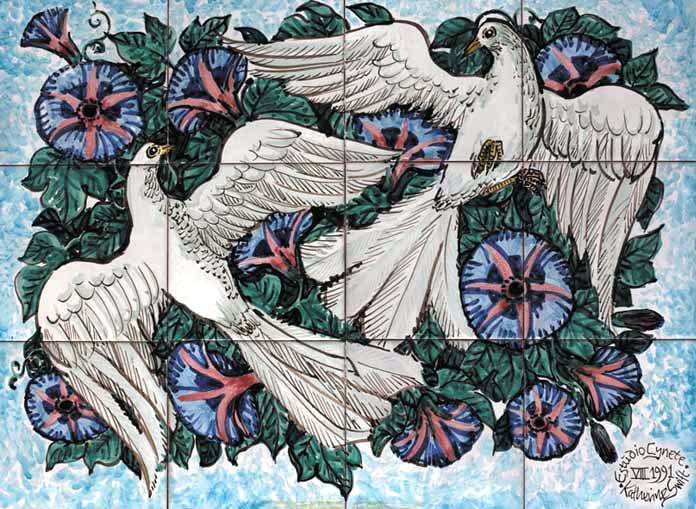 “Morning Glory” hand-painted Majolica tiles (17.5″ x 23.5″), sold at Whyte’s – 10/12/2005 with a similar set for €650.00. 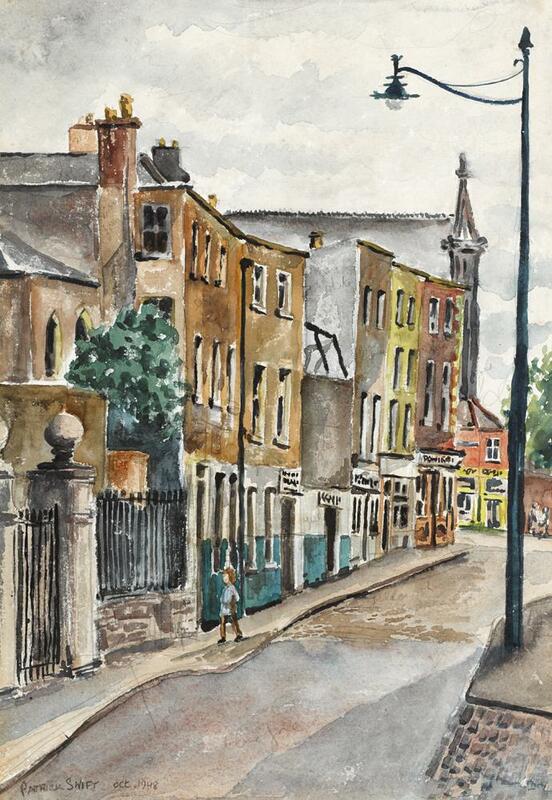 “Church Street, Dublin” October 1948, watercolour (13.5″ x 9.5″), sold at Whyte’s – 27/11/2017 for €1,700. 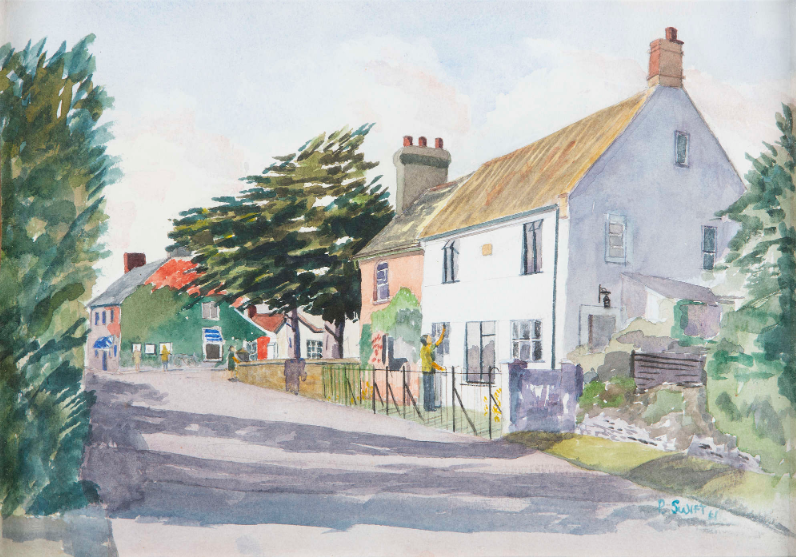 “Country Village Scene” watercolour (8″ x 13″), unsold at Adam’s – 27/3/2019.